There are many ways to make the day memorable and meaningful. Whether our activities take place on March 25th or as near as practicable, we can always point out the gestational interval leading up to Christmas. On the Annunciation feast, we can focus on Christ’s joyfully announced Incarnation or the application of its pro-life import--or better still we can combine the two. But note that as a pro-life observance, the Day of the Unborn Child is different from other pro-life memorials in that it is rooted deep in history upon the wondrous and joyous event of the Incarnation, and this fact that it is founded on the feast that comes nine months before Christmas should serve to remind us that the Annunciation honors the Word made flesh--Christ’s conception, for the moment of Incarnation is truly a celebration of the profound mystery of life as the unborn Christ in his full divinity highlights the full humanity of all unborn children. This page offers a great range of ideas for keeping the day special and keeping its meaning in our minds and hearts. There is something for almost everyone. Choose one, and establish it as a yearly tradition, or try something new each year. Highlighting the Annunciation/Christmas/New Year Connection in Dec. & Jan. Spiritual Adoption is a particularly poignant way to honor the feast of Christ’s conception. Basically it consists of a symbolically gestational nine months of prayer for an unborn child in danger of abortion. We can participate as individuals and families, or more formally in prayer groups and congregations. A church-based program often begins with participants filling out prayer-pledge slips and culminates in a Christmastime parish "baby shower" offering light refreshments and collecting monetary donations and needs-list items for a local pro-life pregnancy center--an approach that beautifully incorporates both the spiritual and corporal works of mercy. Beginning Spiritual Adoption on the Annunciation and ending in a Christmas-season baby shower has the added benefits of reinforcing the pro-life aspect of the feast and its theological significance as the commemoration of Christ's conception, as well as highlighting the oft-unrecognized pregnancy-length interval between these two feasts. Both aspects can be opportunely reinforced during the holidays, particularly at the closing gift shower, to which the whole parish is invited. Another advantage of Spiritual Adoption is that unlike one-day Annunciation celebrations, those who missed the feast day opening of the program can still join in this symbolic period of prayer--for example, if they begin in the first three months of the program they can start by praying for the safety of a child in the first trimester, and change their specific prayer intention for that child every 25th of the month until Christmas. When done for the feast of the Annunciation, the start date is on or near March 25th (or the day to which the feast is moved)--to maximize participation it is often begun on the Sunday nearest or before the date. Pledge slips can be left in pews, in baskets with pencils near entrances, or included in the bulletin. The concept of "Spiritual Adoption" and the nine months to Christmas can be explained in the sermon/homily with an invitation to the congregation to fill out pledge slips and drop them in the collection or a box at the back of the church. The slips can list frequency options--for example: the Lord’s Prayer daily, prayer meeting weekly, or attending an additional church service each month. Participants can choose to pray for a boy, girl, special-needs child, etc.--or leave the selection up to God. A brief pro-life prayer can be used or written for the occasion. A good overview of 9-month Spiritual Adoption for the unborn including programs from the Annunciation to Christmas can be found in the 2002 article here by Clare Conneely entitled "Spiritual Adoption: Nine Months of Prayer" which not only gives practical suggestions like monthly church bulletin inserts with prayer reminders, but also links the pro-life movement and spiritual adoption to the growing awareness of the import of Christ's prenatal life as part of his "hidden life," particularly through the story of Marta Catalano who wrote a "Litany to Jesus in the Womb of Mary" (later given to Msgr. Philip Reilly who included it in a booklet for the Helpers of God's Precious Infants). The article begins: "The phrase 'the hidden life of Jesus' often refers to his life at Mary and Joseph's house in Nazareth. But to Marta Catalano, of Queens, N.Y., it also means his even more hidden life: in Mary's womb." Roman Catholic churches often use Archbishop Fulton J. Sheen's original spiritual adoption prayer. Click here for a website that includes tips for Annunciation-timed spiritual adoption (such as having religious ed. students spiritually adopt unborn babies and begin praying on the day) and links to resources (for example, Archbishop Sheen's prayer in card and bookmark form). Many pro-life organizations recommend the program and there are various resources on the web, for example, a Spiritual Adoption Poster and free print materials at spiritualadoption.org including a selection of Spiritual Adoption Prayer Cards (for which a donation is appreciated but not required). Several Catholic archdioceses that have launched spiritual adoption offer web articles on the program with suggestions, including this one (click link and scroll down page to Spiritual Adoption) from the Archdiocese of St. Louis, which includes the Annunciation start date and baby shower or "birthday party" closing. Particularly helpful is the Spiritual Adoption webpage of The Catholic Diocese of Arlington Virginia which has offered downloadable files including printable pledge card slips featuring Archbishop Sheen’s prayer--or, for slips specific to the Feast of the Annunciation start date see our downloadable slips below. The Annunciation Church/School Program launched in the Catholic Diocese of Peoria in 2006 focuses on Spiritual Adoption and has been requested and successfully implemented in churches and schools of various denominations throughout the country. See the Teens section for ideas on using social networking sites/apps like Facebook and Twitter for Spiritual Adoption from March 25 to December 25 -- you can also follow us on Twitter and Facebook for Spiritual Adoption (see homepage for direct links). Also visit the 2006 section of the Past Events Archive to read the text used to promote the program in Chicago that year at St. Hyacinth Basilica. Ideal for social networking are the videos Lumen TV/Entertainment has done for Annunciation to Christmas spiritual adoption available here -- for more on their program see the Lumen article here. One popular Catholic approach of selecting the Annunciation feast date to start a "novena" of monthly pro-life Masses (often followed by praying the Joyful Mysteries of the Rosary) can easily be combined with and complement a Spiritual Adoption program--both reinforce the nine-month interval before Christmas, and each Mass can be offered for a specific monthly intention concerning the physical, spiritual, and familial welfare of the "adopted" children such as those suggested below for church bulletins. If the novena is for an entire diocese, a church named for the Annunciation or Incarnation can be chosen if conveniently located. Church bulletins can announce the program in advance, explain the reason for starting on the Annunciation, and include monthly reminders with a Spiritual Adoption prayer plus an additional optional intention for each of the nine months. (Sample bulletin text): Please join in our Spiritual Adoption program and pledge to pray regularly for the safety of an abortion-threatened unborn child during the nine months from the Annunciation feast to Christmas. Pledge slips will be available on _______ at _______. We begin on the Incarnational feast of the Annunciation because it commemorates Christ's conception and is increasingly honored as "The Day of the Unborn Child." At the end of the gestational nine-month period, a closing Christmastime "baby shower" will be held collecting donations for a local pro-life pregnancy center. Spiritual Adoption intention for month one: ____________. (Examples of nine specific monthly intentions added to the general intention): (1) healthy development for the child, (2) an uncomplicated pregnancy and delivery for the mother, (3) a pro-life physician to care for them both, (4) that the father encourage and facilitate this life-affirming choice, and be willing to act as a responsible provider, (5) for both parents’ emotional welfare and maturation toward making good decisions for their child, (6) that they be guided by the Holy Spirit in considering adoption, (7) for wise counsel from clergy, and encouragement from friends, relatives, and especially grandparents who will recognize the child as a new member of the family, (8) that the child once born will continue to be safe from harm and raised in a moral faith-filled environment, (9) for the eternal salvation of the child and family. In addition, the Annunciation Society offers meditations on Christ’s development in the womb as monthly bulletin inserts to be used from the Annunciation to Christmas -- right click to save the MS Word file for "The Nine Months of Jesus in the Womb--Mar.25 to Dec.25. Essentially this is a baby-themed parish get-together with refreshments in which there will be a donation bin to collect new items and a slotted box for monetary donations to benefit a local pro-life pregnancy center. All are invited, but if desired, special “Thank You” invitations can be sent to those who filled out pledge slips. The oft-overlooked "Twelve Days of Christmas" after the holiday rush is a perfect time in which to have the shower reminding us that traditionally the season really begins rather than ends with December 25th. Epiphany at the end of the twelve days is also a good choice since the baby gifts can remind us of the gifts Christ received from the Magi--the popular Annunciation Church/School Program has the closing party on Epiphany to collect “baby presents for Jesus.” Whether held before or after December 25th, the shower should be announced well in advance and indicate what items are needed and how checks should be made out. The pro-life pregnancy center should be contacted early on for their needs-list for new items and whether or not gently used baby clothing is also accepted--this info should also be prominently posted in the church and/or bulletin in the weeks before the shower. At the shower, signs, banners, and/or an info table should remind parishioners that the Spiritual Adoption program began nine months earlier on the Annunciation Feast of Christ’s conception to reinforce the relationship between the feasts--this is especially important for those who will come to donate for the shower but did not participate in Spiritual Adoption--see the banners (including a "9 Months 4 Life" Spiritual Adoption design) that can be printed as small signs at our web banner page. Hint: Pastel blue and pink frosted cut-out cookies are attractive additions to the refreshments table. Try using these two pastel colors on Christmas shaped cookies to combine the shower and holiday themes. Use large cutters to add the dates "Mar. 25 - Dec. 25" with a writing-tip icing tube--larger angel cutters are ideal as the theme covers both the Annunciation and Nativity feasts. Baby-themed cut-outs can also be used--for ex. : baby bottle or baby carriage -- for more baby-theme cookie cutter options click here. For printable pledge slips specific to the Annunciation Feast start date, right-click to save the MS Word file for Annunciation Spiritual Adoption Pledge Slips. (Some sites recommend printing the slips on pink and blue paper.) They can be modified or you can create your own--a sample appears below. The 2-part slips should include the info on the nine month pregnancy interval between the two feasts and should also mention the "baby shower" that will be held at the end near Christmas. feast date (also designated the Day Of The Unborn Child) until Christmas. donations for a local pro-life pregnancy center--details will be printed in the bulletin. A "25th of the Month Club" has the advantage of maintaining awareness of the Annunciation's import throughout the year and allowing advance planning for feast day events rather than having the occasion come to mind only in late March without a preparatory season like Advent or Lent that would afford time to plan special activities for the day. It can be combined with Spiritual Adoption (for the nine months from March 25 to December 25), and is also a good way to underscore the gestational symbolism in the Annunciation and Christmas being set a pregnancy-length interval apart. A spiritual emphasis on prayer combined with the practical approach of providing a wide range of suggested activities anyone can do just once a month in very little time makes the initiative accessible for anyone of any age, including people who have not been involved in the pro-life movement before who may be more open to "entry-level" forms of outreach. Churches can print reminders in bulletins or share Tweets and Facebook postings of pro-life prayers and suggestions for the 25th of each month. Ideal for social networking, a recommended activity for individuals and groups can be as simple as clicking "Tweet," "Like," or "Share" for a favorite pro-life article, quote, or photo once a month on that day. Visit the 25th-Of-The-Month-Club page for 12 suggested monthly activities and short tips in "tweetable" form, plus a colorful promotional web banner that can be used on-line or printed as stickers, cards, or small signs. For more see the "25th of the Month Club" section of the Ecumenical Celebration page. Of the many holidays linked to the Annunciation, Easter is the most timely occasion to send/post festive greetings spotlighting that connection. Easter usually falls less than a month after and is still the fourth most popular holiday greeting card. The practice of sending Easter cards is worth reinforcing in its own right, and early mailing and sharing of our print and web Easter-Annunciation cards well before March 25th allows recipients time to appreciate and observe both holidays. Consider our Easter-Annunciation Card or Easter, Annunciation and Good Friday banner (which can be printed as a top-fold card) -- both note the traditional teaching that Christ was conceived and died on the date of March 25th which explains why the Annunciation feast of His conception and the Easter feast of His Resurrection come at the same time of the year. Click HERE for instructions on using our banners in e-mail, blogs, and websites (or printed labels) to show the Annunciation/Christmas/New Year's link. There are several key reasons why the December 25th celebration of the Incarnate Word as revealed at His birth is an ideal time to renew our historical acquaintance with the March 25th feast of Christ’s conception and to spread the word via the suggestions below. First of all, Christmas is naturally linked to the Annunciation, not only as another important Incarnational feast, but also because it marks the end of the gestational interval separating them. Furthermore, Christmas is a mainstream cultural and religious holiday widely celebrated across nations and denominations. Despite all attempts at secularization, the Christmas season is still the time of year when there is general openness to or at least expectation of encountering religious and specifically Christian themes as well as pro-child birth images in the culture--in public displays, store merchandise, decorations on homes and businesses, postal stamps, music on the radio, and media coverage of local celebrations. Additionally, the Annunciation/Christmas connection allows the implicit pro-life message of the feast of Christ’s conception to be broadly disseminated, even to those who might not be as receptive to the explicit pro-life message of the feast as Day of the Unborn Child. Finally, it is the time of year when we have contact with friends and relatives whom we rarely see, and when churches and congregations welcome members or visitors who may only attend services once a year. The combination of these factors makes it essential to take the opportunity to introduce the Annunciation and its meaning into our Christmas season communications, gifts and celebrations. The history of the Annunciation feast as the start of the New Year not only extends these opportunities to address the subject past the Christmas season, but also illuminates the interconnectedness of Christianity with the development of modern and especially Western civilization. The New Year’s connection allows the Annunciation feast to be presented as an interesting historical fact in a secular context to those who don’t celebrate Christmas. Those who would not be attracted to the religious or Christian aspect of the feast, or its modern assignation as Day of the Unborn Child, might nevertheless be interested in the history of the old calendar and its holidays and observances. A New Year’s greeting that includes this not-so-trivial bit of March 25th trivia can be an ideal way to introduce the Annunciation feast to secular and non-Christian friends, family, and business associates. The former status of Annunciation Day as the beginning of the year reminds us of the historical centrality of Christian practices as reflected in secular society, providing a stark contrast to modern agendas that paradoxically attempt to deny and root out that influence. In an age that devalues the formative influence of religion in the public square and denies the moment of conception as the beginning of life, it is instructive to consider that much of the world including Western civilization officially began the New Year on a Christian feast day celebrating the conception of Jesus Christ. It is providential that we have these additional opportunities to maximize the impact of this once-a-year feast. The two most popular Christian feasts are already reinforced as seasons rather than one-day observances. The season of Christmas can be extended with the preparation of Advent and the historical 12 Days of Christmas. In the case of Easter, many Christians observe the season of Lent and the octave of Easter, and Sunday worship can serve as a reminder of Easter Sunday every week. The Annunciation feast, by contrast, comes only once a year, lasts only one day, and has no official period of preparation, so it is important to make the most of its relationship to other holidays--Christmas, New Year’s, and Catholics should also note how the nine month interval between the feasts of Christ’s conception and birth is also found in the interval between the feasts of Mary’s conception (Dec. 8) and birth (Sep. 8)--the December 8th holy day of obligation being another opportunity to discuss these two pairs of feast days. The history of the March 25th Annunciation Day as the start of the New Year allows us to use this fact to raise awareness after Christmas and beyond. For example, a holiday season e-mail signature and larger size envelope/package seals can feature text on the Annunciation’s relationship to both Christmas and New Year’s, and these can be used on all mailings well into January. Rather than send separate cards, it is more common to include a New Year’s greeting in Christmas mailings, and perhaps the best way to do this is to include a calendar for the coming year imprinted with info on the Annunciation--either include our downloadable calendars, have them professionally printed, make your own with a home publishing program, or order custom calendar-style Christmas cards. Custom-made New Year’s cards (designed with a home publishing program or on-line printer like Vistaprint) to which you can add information on the Annunciation as the old New Year’s Day are another option. Both Christmas and New Year’s cards can be custom ordered as calendar style cards or mailable magnets. The calendar greeting approach presents an opportunity to give year round reminders of the Annunciation to family, friends, and associates. Our web banners (such as the one shown below) used in e-mails, posts, or websites, are one of the most effective ways to promote the Annunciation/Christmas link -- click HERE for the instructions page that also features a banner covering the New Year's connection; these can also be printed on sheets of labels as described in the next section. Perhaps the easiest way to spread the word about the Annunciation is to change or add a special e-mail “signature” for all your outgoing e-mails at the start of the December holiday season through New Year’s Day (you can also use it in March): Your usual closing and name and as much information about the feasts as you like, for ex.--“A Blessed Annunciation (Mar. 25) + 9 months = A Merry Christmas (Dec. 25)” and a line to connect it to New Year’s such as “New Year’s was Celebrated on Annunciation Day in the Pre-Gregorian Calendar” or “The Annunciation Feast of Christ’s Conception was the Old Calendar New Year’s Day Celebrated Nine Months Before Christmas”--in addition to being free, other advantages of using an e-mail signature are the unlimited text and the fact that e-mails often get forwarded. Save one of our Christmas/Annunciation banners like the one above as your screen background for the holiday season. Right-click the banner above to get the menu option to save picture/image (or set picture as background) -- if saving the image choose desktop as the location -- then go to the image on your desktop and right-click to get the option to set picture as background. For phones/tablets touch and hold the banner above to save -- then go to the saved picture and use your tablet/phone's option to set as wallpaper, (which may be a menu option when viewing the saved image, usually accessed by touching or dragging down the upper right corner of the screen). Visit our Web Banners page for additional images to choose from. Though more cost effective than labels, ink may smudge on some paper types and may not be as readable on dark red or green envelopes. If choosing a stamper, consider the jumbo size self-inking with 7 (or fewer) 36-character lines. If you prefer a more decorative label with a graphic, Colorful Images offers many holiday themes including the larger square shaped style. Most have a 4 line 26-character-each limit. To order just click on a design below and type the text of your choice into the name and address boxes after adding the label to your cart. Graphics that cover both Annunciation/Christmas include the 4-line 26 character golden bells (also good for New Year’s). Traditional Christmas decorative labels include the 4-line 26-character evergreen border, poinsettia/candles, & angel at the manger. You can download and print our two styles of Christmas/Annunciation note/post-cards from the web banner page. There are also several commercially available styles of Christmas greeting cards that feature Annunciation graphics--some art galleries offer Christmas card versions of their Annunciation artworks via their websites, while larger retailers may offer some as well, such as the following with the greeting, "May the love of Christ surround you at Christmas and always". These rarely note the Annunciation's significance or relation to Christmas, so you may want to use Annunciation-Christmas labels with these cards, or write your own note pointing out the nine month Mar.25/Dec.25 interval between the two days. (Note that many Christmas cards are available only seasonally--if not available check back in autumn). "Mother of Life" Christmas cards feature Nellie Edwards' artwork showing an expectant Mary dressed as Our Lady of Guadalupe and a point of light emanating from her womb, as well as the artist's "Word Made Flesh" poem about Jesus' prenatal life -- see the "Mother Of Life" section here at the Further Reading and Visual Materials page. One unusual customizable card features an apropos poem by Rita S. Beer reminding us that in carrying Mary to Bethlehem the humble little donkey also carried the pre-born Savior. The set of 20 can be personalized allowing both card and envelope to include info on the 9 months from the Annunciation to Christmas--6 lines of 25 characters each for card, and 4 lines of 48 characters each for the envelope. The cards are available at Miles Kimball or at Walter Drake. Use the "Select" drop-down menu to personalize the card/envelope. You can see text examples on various card designs at our Facebook page Album for Christmas-Annunciation cards. For the text consider: Line1: Annunciation Day Line2: (March 25th) Line3: + 9 Months = Line4: A Merry Christmas Line5: (December 25th) Line6: Happy Holy-Days! Madonna House (founded by Catherine Doherty) offers a similar card ("The Donkey Carrying God" featuring the artwork of William Kurelek) that could be effectively paired with the labels suggested above; the card’s text reminds us of Christ's Incarnation in the womb of Mary and His prenatal life by focusing on the lowly donkey whose "bells were the first church bells"--"carrying a Virgin who carried God" on the way to Bethlehem where He would be born. The entire card quotation written by Doherty (whose cause for canonization is under consideration by the Roman Catholic Church) can be read on the website -- see the greeting card ordering page for Madonna House publications and also the direct ordering page for the cards. Customized Holiday Cards (regular folded, photo, and postcard styles) are available in angel or other Christmas themes -- just select type of card and then choose from many themes and designs and add your text. Calendar cards (folded, flat, magnet, or inserts) are ideal for both Christmas and New Year’s Day and the perfect way to highlight the connection the Annunciation has with both holidays, serving as a reminder of the feast for the coming year (remember to point out the calendar connection by adding text on the 9-month interval plus the fact that the March 25 Annunciation was the old New Year’s Day. Many small items can be ordered with a line or lines of text. One suggestion that’s sure to be a keeper is heat-sensitive color-changing mood pencils--see the following site link with a generous text allowance in quantities of 100 and up can be personalized with 4 lines of text and 35 characters per line (for text ideas see the label suggestions for 3-4 line envelope-package seals/stickers). For smaller quantities, the thermo mood color change pencils may be available HERE in a set of 12 (the 12 set allows only 30 characters) -- if color change pencils are not available there is an eye-catching dozen with holographic stars and easy to read text/background (to save space separate the words with capitalization rather than spaces and write the line equation style to show the interval between feast days). Note that high quantity minimums of the mood thermo pencils needed for schools/organizations can be ordered at many custom pencil sites -- sometimes called funtouchable for the heat-sensitive color change -- these vary in their text/character allowance. A Christmas tree ornament has the advantage of being brought out every year as a reminder of the feast days, and if reasonably durable can be handed down as a keepsake. Some tree ornaments can be homemade using the image/text ideas below and those found under the gift tag and envelope seal sections. However, modern technology allows you to add your own text on-line to professionally made wood and metal ornaments that can be given/mailed as gifts. Some of the metal and fabric ornaments described below are sufficiently flat and lightweight to be inserted in Christmas cards. Many sites such as those below allow you to design your own ornament on-line by typing your message into text boxes for various ornament styles--some also allow you to choose a style of lettering. into each of three lines, and you still have one remaining line for a family name or additional greeting like Happy Holy-Days! or Celebrate the Holy-Days! When done, use the preview option in case you want to add/remove spaces. Note that adding a 4th line may make all text smaller. Most appropriate is the angel design which covers both feasts and allows 4-lines of 25-characters each--you simply click the button to personalize and enter your desired text in the line boxes. There is also a star design with 4 lines of only 20 characters each. Individuals and organizations needing larger quantities of customized ornaments have additional options. Wood can be purchased through the links above. For mailable ornaments thin enough for an envelope, fabric ornaments may be available at some promo/custom sites, but will be less durable over the years. Thin metal ornaments can fit in a Christmas card envelope -- for examples: see the Shining Star ornament easy to personalize as it will look elegant with plain black text, or the Star Holiday Ornament which is 3-D but mails flat, and the gold filigree Express Holiday Star Ornaments -- for the latter two you may want to choose Red text for a festive look on a standard white background and then type the message you want, or you can upload a colorful graphic image that includes text. Design a Christmas/Annunciation theme tee/sweatshirt, pin badge, key chain/pendant and wear it for the holiday season. These wearable tools for evangelization can also be given as gifts. Pins can be worn on a coat in cold weather. For the shirt you can use iron-on printer paper or fabric paints to do it yourself, or have one made for you (online or at mall airbrushing kiosks), or design it yourself at Vistaprint. Badges can be made easily with do-it-yourself snap-together clear pin buttons (or even the common rectangular fold-over ID pin badges ideal for a children's project). For maximum impact extra large 3-1/2 inch clear round snap-together badges that require no button machine are available at this site and also at here this link -- they are sold by the piece at some craft stores like Michael's. The same style of snap-together buttons can be found in a smaller 3-inch size at this link. Clear insert key-chains round or rectangle can be converted to pendants with a cord--for these and other clear insert-items in various shapes and sizes visit your local craft store or -- click here for rectangles and round shape keychains --and here for more clear snap together items. You will need card stock or heavyweight paper and a hole punch and string for the corner. (For a smaller hole try a 1/8 in. scrap-booking punch or a thick needle threaded with string or ribbon). Simply cut a long rectangle twice as long as the finished gift tag should be, and fold in half. For example, a standard 8 1/2 x 11 sheet will produce 6 tags large enough for a small drawing or collage--cut the sheet in two 5 1/2 x 8 1/2 halves, then cut each half into thirds 5 1/2 x a little over 2 3/4. Then fold strips in half--tags will be squarish in shape. With the fold at the left, punch a hole in the upper left corner. On front of tag, write or paste a cut-out “Merry Christmas” at the top, and then “from:” below that, and “to:” near the bottom--leaving space to fill in names later. Open tag (there will be two panels). On the left side write at top: “Annunciation Day” or “Feast of the Annunciation”, and on the right side across from it write “Christmas” or “Feast of the Nativity.” (“Feast of the Nativity” is a much older name for Christmas). Then near top under the feast names write “Mar. 25” on the left, and “Dec. 25” on the right, across from each other--then in the middle between the two dates write “+ 9 months =” or “plus 9 months equals” (this should be written across the fold). Then draw or paste small pictures of the Annunciation on the left (Mary with angel, Mary with halo around her womb, rays of light coming from dove down to Mary), and of the birth of Jesus on the right (manger, holy family, star, sheep). When done children should sign their tag on the back after “made by” and add the year. Then close tag and feed string or decorative cord or ribbon through both holes in corner and tie with a double knot so that loop is at least 4 1/2 inches long (long enough to attach to gift bags by wrapping the string around handles and feeding card through loop and pulling tight). You can download and print our credit-card sized cards--a new calendar is uploaded in November in time for Christmas mailings. They can be printed one-sided, and you can sign the back with a personal greeting to each recipient; or, you can print one of the optional back sheets that has additional info on the feasts of the Annunciation and Christmas (with a carnation and poinsettia graphic) and either a blank space for your own greeting or our dot.com URL address. Note: If you choose to add your own greeting in MS Word, download the blank-space backing file, open the file with Word and double-click the calendar image in the document --there is a text box in edit mode (between the flowers) that you can personalize with your name, recipient's name, year, etc.--remember to close the picture after editing and to save your changes. Print in color on best quality setting and try a coated heavyweight paper for best results (photo paper, smooth cardstock/greeting card paper, or heavyweight graphics/imaging paper). Right-click the following three links to save and print our business-card-size pocket calendars and optional dot.com back or optional blank-space back -- or the following for larger wallet-size mini calendars which also have an optional dot.com back wallet size or blank-space back wallet size. (The calendars can also be used in March as enclosures if you send Annunciation cards -- Greeting Cards with a Carnation theme for the Incarnation or Cards with a traditional Annunciation theme. For large quantities (usually over 50) you might visit an office supply store in person or on-line to have standard business card stock professionally printed with any text you desire on the front and the calendar on the back. CHRISTMAS MINUS 9 MONTHS = ? CHRISTMAS – 9 MONTHS = ? NEW YEAR’S DAY IN MARCH? TWO 25THS TO CELEBRATE ! If you want to include Annunciation/Christmas theme calendars in Christmas mailings every year it might be worthwhile to learn to make your own--many home publishing programs have calendar options--the graphic options for calendars are linked to programs that calculate the days for whatever year you enter. Your program may give you the option to choose a small calendar (pocket or desk size), and most have full sheet options. Full sheet calendars can be printed from the home publishing program. For mini-calendars you may have to copy/paste your calendar into a word processing program, as follows. Once you have the calendar formatted the way you want (adding your text at top and bottom, font changes, etc.) you can copy it as an image. First you may have to click and drag around the whole calendar to group the months and titles as one image (a single red border around them all shows they have been grouped), and right click to copy. Then tile it across a blank document in your home publishing or word processing program to print out several per sheet, on smooth card stock, greeting card, or photo paper. You can sign the backs with a personal greeting. A standard sheet can easily accommodate 8 credit card size calendars in two columns of four. Or for a tent style desktop size calendar you would divide a standard size document into four sections from the top down--a sized-to-fit calendar can be copied into the 2nd section and the 4th at the bottom; then print and cut the sheet in half crosswise, cut off the blank edges, fold each in half and you have two stand-up calendars. However you size and print the copied calendar, remember to keep the original calendar (original size but with your additions) as a home publishing file that is still linked to the calendar program--then you can just update it every year by entering new dates (to change the date in the saved file, some require you to enter the new year separately for each month). 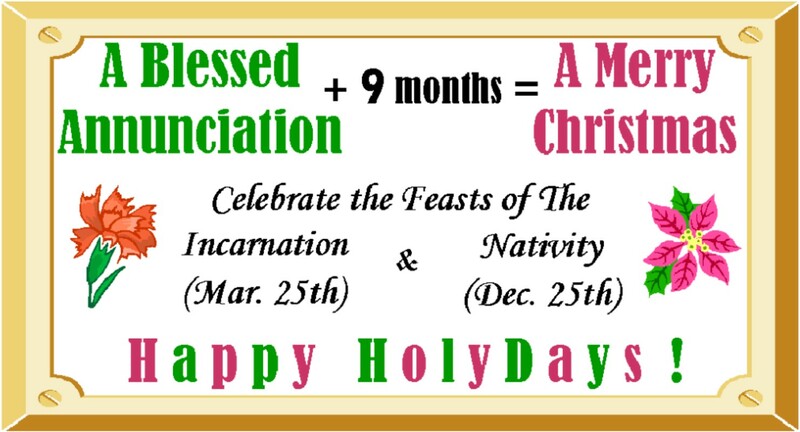 Note: The top line of your calendar should include a catchy slogan--for example, “A Blessed Annunciation + 9 months = A Merry Christmas“ -- with additional facts on the feast on the bottom or back. Also, the 25th of March and December can be highlighted in a red font or with red circles. The most natural way to introduce the Annunciation as the occasion of Christ’s Incarnation and conception is in a Christmas Eve or Christmas Day sermon/homily, which reaches the greatest number of people because of increased attendance. But any Sunday during the holiday season is a good time to touch upon the history of the Annunciation feast date and its relationship to Dec. 25th. Those who want to comment on the pro-life import of Christ’s Incarnation can point out that the contemporary observance of the “Day of the Unborn Child “ takes place exactly nine months before Christmas on the traditional day commemorating Christ’s conception--March 25th. It needn’t be the focus of the whole sermon--just a brief comment to address the subject takes only a few moments. Additionally, the large public space available in a church can be utilized with a banner conveying a simple message such as: “A Blessed Annunciation + 9 Months = A Merry Christmas” and/or “Celebrate the Incarnation & Nativity--March 25th & December 25th--Exactly Nine Months Apart". Any one of these approaches can make an important contribution toward fostering not only our reverence for life but our understanding of Christology and the Incarnation--for this single reference in church on Christmas may be the only time Christ’s conception is brought to the attention of the congregation, especially those who come only once a year. The all-important moment of Incarnation--the central theme of Christianity--is often left out of depictions and discussions of the Annunciation, because it takes place hidden in the womb of the Virgin Mary on a scale too small to be seen. Even eyewitnesses standing by at the Annunciation could not say they saw the Word become Flesh, and artists who try to represent this real event by painting a window on the womb can only effectively show a later stage of prenatal development, not the microscopic level of conception. It is easy to visualize the angel and Mary or a dove floating above representing the Holy Spirit, but the embryonic Christ concealed in the womb of the virgin is a challenge for our imagination; it is a challenge even to imagine friends, family, and other ordinary human beings at this prenatal stage of life--how much more challenging to imagine God as that tiny embryo. “Out of sight--out of mind” is often equally true of the mind’s eye, especially when the pivotal fact of Christ’s conception can be overshadowed by beautiful mental images of the archangel Gabriel we can so much more easily visualize. For this reason there is a need for an abstract symbol not native to the oft-portrayed scene, but clearly referencing that most momentous event there taking place. The beauty and fragrance of flowers and their varied types make them natural symbols. From the time of the ancient Greeks through the Victorian era, flowers have been used as a symbolic language or “florigraphy.” Holidays (or holy days) and observances often have specific flowers associated with them. Christmas has the poinsettia, Easter has the lily, and pro-life Roe v. Wade memorials use the rose, but a visually appealing symbol is particularly important when illuminating an unseen mystery. In this case, it is the unique and unparalleled moment of Incarnation--the conception of Jesus--which, paradoxically, takes place in the material world but cannot be seen by man and remains hidden for nine months. The carnation is a much-needed and welcome symbol that in its very name focuses the mind on what happened on that awe inspiring occasion. The literal translation of “carnation” is a “flesh-colored” flower--making it an appropriate symbol for the enfleshment of the eternal Word even if it were not a near sound-alike for the theological term. Dianthus, its aptly named genus, means "divine flower" or “flowers of god.” But one needn’t know any facts about the flower to make the connection with “Incarnation”--these nearly homonymous words were once synonymous for a rosy hue--and the association between the two comes quite naturally. In fact, when the U.S. Postal Service revealed the name of the artwork featured on the 2007 Christmas Stamp -- Bernardino Luini’s "Madonna of the Carnation"--some assumed a printer's error cut the "In" off the last word of the title (the cropped image on the stamp made it hard to recognize the small flower in the hand of the infant Christ). Art aficionados may have recognized the work as one of several identically titled paintings by famous artists like Da Vinci (see detail) and Dürer depicting Mary and the baby Jesus holding the beautiful blossoms as in this alternately titled painting by Bergognone. In the past, carnations have had various meanings, including maternal love, and the points or “pinks” of the petals were used as symbols of Christ's Passion--the carnation therefore also has the advantage of representing Christ’s entire earthly life from virginal conception to his redemptive death. Moreover, once established as a well-known symbol, this common florist-flower seen year-round can serve as a frequent reminder of Christ's incomparable gift of Himself in the flesh. Carnations present us with many lovely ways to make a poignant memory on the feast day--in the form of a thoughtful gift, beautiful bouquets in church, a single bloom on the dinner table, or worn as a boutonniere by both men and women. They come in a wide variety of colors, from the plain white you find at the florist to the Black King carnation with petals so darkly red they appear velvety black. As symbols of the Incarnation, keeping in mind the meaning of the words, flesh-toned carnations (rose, pink, and peach pastels are the most common) are preferable to the more bright purples, red/orange, and striped varieties. Click to read more about our downloadable “Carnations for the Incarnation” paper ribbons, which can be attached to the stems to highlight the symbolism. For an emphasis on the pro-life aspect of the day, use the smaller baby carnations, or a mix of pink carnations and white dyed blue (click for instructions). Artificial carnations are especially useful for crafts--they may be easier to find and far more affordable at dollar and discount stores than craft/party specialty stores. See the suggestions below for specifics on using the carnation theme in particular Annunciation feast activities and settings, including the church, parish, and school; ideas for the home; organizations or families hosting a dinner/party/tea/event; baked-goods and candy; gifts and party favors; crafts for adults and children, and cards/invitations, envelopes and seals. Flowers have long been used in church as examples of the beauty of God’s living creation. Use carnations prominently in church on the feast day or on the Sunday before or nearest the feast, with clear mention of the symbolism and the day’s significance. For example--on the feast day, have a first communion class enter church in procession holding carnations. The site www.wrapwithus.com has fabric carnation pins in several colors with ribbons that you can personalize with your own message. Annunciation events that focus on the Incarnational reality of Christ’s conception are sometimes called “Incarnation Celebrations”--carnation graphics can be used in fliers, signs, and bulletin inserts promoting the events. Celebrate the feast by having a carnation sale fundraiser with a portion of the proceeds benefiting a local pro-life pregnancy center. Fundraising carnation sales for churches and charities are often promoted as Carnation Day, but the practice can easily be applied to the celebration of Incarnation Day to reinforce the meaning of the feast and raise money for a worthy life-affirming cause. Click here for general info on having a carnation sale. Contact your local nursery or florist for flowers, and offer to place their name on the order forms in return for a discount. Promotion of the sale should stress the carnations are being sold for the Annunciation feast of Christ’s Incarnation with proceeds going to a pro-life pregnancy center in memory of that moment of His conception--Right click here to download/save a promotional sign with this info and carnation graphics (standard size sheet--print best quality color in landscape). Though they lack the visual appeal of the flower, carnation seeds are the ideal symbol of the Incarnational conception of Christ--a seed represents new life, and the blessing of seeds is an old Annunciation Day tradition. Their small size brings to mind the embryo--the tiny plant embryo hidden within the seed coat as the newly conceived Christ was hidden in Mary’s womb. Right-click to save our "Carnations for the Incarnation" color sheet (with the feast name, date, etc.) which can be cut and folded into four mini seed packets, or into paper ribbons to staple to clear bags/packets if desired--see instructions below (for printed fabric ribbon see Give Fresh Flowers section). A standard carnation seed packet from a nursery or home store is enough for 10 or more mini packs--a small pinch a pack. For larger distribution, bulk carnation seeds can be purchased on-line in a multi-color mix at neseed.com (various quantities--1/16 oz. to 1 lb.). For other color varieties and quantities check edenbrothers.com, which sells in small packets or by the ounce. Right-click the link to save and print our standard size color "Carnations for the Incarnation" sheet (one sheet makes four packets). Cut the sheet in four 4 1/4 x 5 1/2 in. quarters. Place one of the quarter sheets long-side vertical, so that the writing is right side up as for reading. Flip it sideways so the printing is face down. Fold up from bottom in half (half the printing is now visible upside down). Then fold right edges up about 1/2 in. and crease down toward the center--do the same with the left edges. Then fold these right and left folded edges in again toward the center so they almost touch in the middle. Crease all folds tightly. The side facing down should now have a pocket about one-and-a-half inches wide--put a small pinch of seeds in the pocket (enough to rattle--at least 7). Then with folded side facing up, fold the top down about 1/2 inch and crease the several layers tightly especially at corners. Flip packet over side-to-side so smooth side is facing up, and staple near top centered about 1/4 inch down to secure flap. The most common suggestion for using carnations on the Annunciation is to have fresh cut flowers for the dinner table. Most everyone can buy a single carnation for the occasion, and take a few moments to say a special grace before the meal thanking God for the incomparable gift of His Incarnation and asking him to protect unborn children. Pro-life organizations such as American Life League recommend making a carnation centerpiece for a more formal feast-day family dinner -- League click here to read the archived article. Women for Faith and Family has an Annunciation webpage featuring an Activities With Children section that also suggests using carnations in a household shrine -- explaining to children that they symbolize the Incarnation and allowing them to sprinkle the flowers with holy water. EWTN’s web page on celebrating the Annunciation includes these and adds info on the meaning of the carnation as symbolic of the Incarnation, life, love, and the crucifixion. Note: Instead of throwing faded flowers away, remove the freshest most colorful petals and press them flat--use as confetti in or to make pressed flower Incarnation Day greeting cards to send next March--see section on Carnation-themed Greeting Cards. For dinner parties, see the suggestions for a carnation-themed event/diner/party/tea below. Invitations can be sent with a carnation theme including carnation confetti inside--see cards/stationery. Please also see the favor suggestions under gifts, and the dessert ideas in the baked-goods/candy section. Many carnation design party items including invitations can be found/personalized at the link here. Use a vase of fresh cut carnations, and offer one to each of your guests to take home as a reminder of the feast day--you can also attach paper “Carnations for the Incarnation” ribbons (click for more info) by downloading our color printed sheets (for printed fabric ribbon see Give Fresh Flowers section). For a more formal table, order or create your own carnation florist-style arrangement. Use the instructions for making carnation cupcakes here but use mini or even smaller "Cutie" sized cupcakes. Use pink or peach frosting, and if desired, green cupcake cups (if unavailable in a mini size you can tint white cake batter green). Instructions for assembling cupcakes into a bouquet can be found on various websites -- for an example click here. Stems can be green toothpicks (extra long), b-b-q sticks, straws, chopsticks, stirrers or swizzle sticks (wooden sticks can be tinted green with food coloring). You can use regular size toothpicks with the extra small cutie cupcakes (the size of a quarter) -- click here to see the Mrs. Fields Cutie Cake Pan. For small gatherings make sure you have at least one "flower" cake for each guest's dessert. For larger groups one bouquet can be centered with individual carnation cupcakes arranged around it on the table. Fresh carnations also make a lovely addition. Floating carnation-shaped candles in a clear bowl (using cut crystal reflects the light) will create a lovely atmosphere, and they can also be given as gifts and favors -- click the following links to see options: Reasonably-priced small floating carnation candles can be purchased in various colors, including peach, on-line. Those who prefer the fragrance of carnation can choose a scented jar candle -- there are several stores that have it in various forms (pillar, jar, gel) -- a variety of click here for a variety of pink scented carnation candles also available. If many small favor-sized scented candles are needed large quantity small votive carnation scent candles (choose carnation scent and desired color and shape from their drop down menus--you can also click the option to add personalized labels and tags and add the "The Annunciation~Feast of the Incarnation" and any additional lines as space permits ( Mar.25~9 mos. before Christmas, The Old New Year's Day, Christ's Conception, The Word Made Flesh, etc). For a unique potable centerpiece, consider a “flowering” carnation tea--see details under Afternoon or After-Church Tea. Stemmed carnation-shaped soaps in a vase make a fun centerpiece that can be divided among guests as take-home gifts. A bouquet of up to 12 soap carnations can be ordered on-line in a choice of colors. Larger quantities of the carnation soap with stem can be ordered for less per piece -- note price comparisons for wholesale. Basket of Colorful Carnation Soaps: A basket of pretty molded carnation soaps makes a lovely centerpiece and provides take-home favors. They can be displayed in a basket or clear bowl or scattered among greenery on the table. See a selection here or view the examples at etsy . Stemmed carnation candies can be used as mini bouquets in bud vases. See the section on candy making. If cloth napkins are used, tuck a small carnation (real or faux) into each napkin ring. You may also be able to find carnation themed paper napkins and plates for more informal gatherings. Artificial carnation leis or dollar/discount store carnations can be cut into wedge shaped petals and scattered on tables or put in carnation-themed party invitations--also available in jumbo size with larger petals HERE and also at this site. You can also use real petals. Wedding supply stores sell freeze-dried carnation petals, in addition to whole dried carnation flower heads -- or preserved carnation flower heads -- but a le a less expensive option would be the Internet tea supply stores that sell which dried carnation petals, which may not be as well preserved in shape or color -- better yet, press/dry your own carnation petals. Flowering or blooming teas feature a compact bouquet of long tea leaves with a dried flower in the center that opens in the hot water--these are usually white or green teas which allow the flower to be easily seen. They can be served as a beverage and/or enjoyed as a display centerpiece in a glass teapot, brandy glass, or other clear container. Another harder-to-find option is “tethered” flowering carnation tea--these are on a string and steeped like a tea bag--suitable for small clear pots or clear cups (one is strong enough for a few cups). To view some options click here. A peach-color carnation is available in a box of Carnation's Love Blooming Tea -- another similar color is Carnation Immortal Peach Blooming Tea. For a red flower try Red Song blooming carnation tea available at this Amazon link and more on-line merchants here. If you just want to try one or two, you can buy Red Song blooming carnation teaposies by the piece--click here then scroll down and select from the drop down menu or go to the Teaposy website. [Note that not everyone likes the flavor of blooming teas (almost always green or white tea with floral or spicy flavor), so have regular black tea available as well to serve -- even if the flavor of blooming carnation tea is too exotic for guests it will make a lovely centerpiece for the table]. All of the following make thoughtful party treat/favors, packaged gifts, or desserts. Make carnation cookies with your favorite cut-out recipe or with any round cookie. Quick method: Use round store bought or ice-box cookies cutting off round slices to bake--then frost with canned pink frosting (or white tinted peach with food color) and use a fork to lift up spiky peaks in the soft icing (also works for cupcakes--use green baking cups)--see Facebook page photo section for pictures. Note that with this method they cannot be stacked for transport or gift-packs and are hard to write on with icing. (If these are for parties/events use real or faux carnations on the display table, and a Feast of the Incarnation sign to include info on the feast day--right click to download and edit the text of our flower graphic carnation sale sign.) For stackable cookies with feast day info written on them: The spiky pattern must be pressed into the cookie to create a flatter surface: Use round, or for best effect crinkle/fluted edge or flower shape cutters with 10 or more short scallops. Then choose a non-spread cut-out recipe that holds form, and in the creaming butter stage add food color to tint batter pink or peach during mixing (if doing two batches, consider leaving one un-tinted for contrast in presentation). When cookies are cut out and placed on baking sheet, use a small fork with tapered teeth (narrow pickle fork, or for large cookies a spork) to press the spiky petal points into the dough at an angle in a spiral pattern from center outward--press firmly enough to create pattern that will hold during baking but without flattening or deforming round shape. To preserve color do not overbake or brown top or edges. When cool use white writing icing or easy food coloring markers to add text around the edge: Mar. 25 on medium size cookies, and Incarnation and Xmas-9 Mos.=? or 9 Mos. Before Xmas on the largest cookies. For fully-frosted cookies with text: Bake plain un-tinted un-patterned cookies and press spike pattern into flat icing instead of unbaked cookies: Frost the top smooth with pink cookie icing, wait till it is semi-hard and gently press the tip of small fork or spork into firm frosting in a spiral pattern as described for pressing pattern into dough--since frosting is the last step you can press the pattern into icing more lightly than into unbaked dough (which can more easily lose an imprint). Then write around the edge with white icing. Note that if these cookies are displayed on a large plate or tray, not all have to have the text--just a few of each, and if given as homemade packaged gifts just one of each will do. [NEW: For side view carnation cookies you can decorate with green for the base and another petal color icing, consider this cookie cutter style carnation set for fondant flowers -- (the largest being 6 x 7 cm) -- see it here. Also NEW is another side view carnation cookie cutter and stamp set that allows you to make unfrosted cookies with a carnation embossed imprint on top in addition to the shape from the cutter -- just choose a cookie batter that holds its shape well]. Fluted or scallop edge cookie cutters like the ones at this link work well for round top-view carnation cookies. For the largest cookies (that can accommodate the most text), try large biscuit/cookie cutters (3 to 5 in. diameter) --particularly those with a zigzag or rippled "crinkle" edge like this extra large carnation cookie cutter or see those pictured at this link. Williams-Sonoma stores have a set of fluted round decorative cutters that will work for cookies as well as biscuits. Other Internet merchants offer the set of 6 fluted cutters (2 to 4 1/2 in.). Carnation-shaped chocolates (each in cellophane tied with ribbon) can be purchased on-line at chocolatevault.com in milk, dark, white, or tinted pink which are especially pretty -- see more here. (For homemade carnation chocolates including stemmed flower style, make your own with the molds below). Craft stores and the bulk section of supermarkets carry melting candies allowing you to make carnation-shaped chocolates including the stemmed lollipop-stick style with the carnation molds below. Note that white melting chocolate and mints can be tinted pink or peach. Click here for a mold for mints. A sucker-style lolly or lollipop chocolate carnation mold is available here. Chocolate cupcakes can be used as edible pots for single or bouquet carnation candy pops. You can also find online directions for using them in charming chocolate candy pots -- just substitute white or pink tinted carnation chocolate pops for the roses in the instructions for Mini Chocolate Roses in Flower Pots at the archived page for Mini Chocolate Roses in Flower Pots (note this is an old page from which molds can NOT be ordered). To order chocolate flowerpot molds see current offerings here. Other styles of carnation sucker molds have been available in the past and may be available used -- such as the mini 1 inch #AO-551 Carnation Pop or the larger 1 oz. 2-1/4x2-1/4 in. F-3 Carnation that has a leafy base engraved into the mold. You can see an old photo of both at the archived Sugarcraft site (ordering is NOT possible from it). Order or bake a special Incarnation Cake with a carnation theme. Writing on the cake might include: The Incarnation--March 25th--(9 months before Xmas). Order it topped with icing carnations. If you are making it yourself, you can decorate it by “drawing” simple flat carnations with zigzag petals made with a pink skinny-tip icing tube, or for a more professional look, order molded chocolates (including white tinted pink), or ready-made sugar carnations in various colors can be purchased online in Gumpaste and are also available in Royal icing. Some bakeries may allow you to provide a carnation picture for photo cakes--see our "Use Web Banners" page and skip to the E-card section at bottom for rectangular and oval graphics, or download the Carnation Pin Badge graphics for examples of a round design. Less experienced cake decorators might want to try the "Easiest Carnation Ever" set of 2 cutters and read the tips on making carnations with an icing bag, or, more experienced bakers wanting very realistic flowers can consider the carnation gum-paste/fondant cutter set or the variety of cutters to make carnations and the leafy green calyx base -- click here for more in this style. Another style carnation cutter set for paste/fondant petals can also be used for side view carnation cookies (the largest being 6 x 7 cm) -- see it here. The carnation theme can extend to the serving plate and table decorated with artificial carnations (from discount/dollar or craft stores) or petals cut from faux carnation leis (sold at party stores) -- for links to buy carnation leis online click here. [Note: Although real carnation petals organically-grown and washed are considered edible flowers and can be used to decorate cakes, the leaves have a mild toxicity and whole flowers or flower heads should not be used on cakes, especially if small children will be present. Food quality carnation petals from specialty stores can be candied, sugared/crystallized, used in jams, butters, salads, desserts, or a hot sugar syrup for fruit. If you intend to cook with carnation petals, consider growing your own organically--for example, the Peach Delight Carnation is desirable for both taste and appearance -- see photo here -- find info on seed/plant availability here -- see more info on characteristics of the Peach Delight carnation at the archived site here -- or read about its color and flavor here (at the linked page scroll down to "Kitchen Notes" with culinary suggestions-- ordering NOT possible from this link) -- to check T & M's site for this carnation search their new website at this link. A gift given for the Annunciation should be simple and remind us of Christ’s gift of his Incarnation and the gift of life itself--the carnation flower as a beautiful living symbol provides a perfect theme. Carnation-shaped chocolates (each in cellophane tied with ribbon) can be purchased on-line in milk, dark, white, or tinted pink. (For links to purchase ready-made, or instructions to make homemade carnation chocolates including stemmed flower style see the chocolate and mint section of carnation-theme baked-goods/candy). Floating carnation-shaped candles in a clear bowl (using cut crystal reflects the light) creates a lovely atmosphere, and they can also be given as gifts and favors. Please see the section on carnation candles as table centerpiece section -- note that one of the merchants allows you to add a customized table with your own text -- you might add "The Annunciation~Feast of the Incarnation" and any additional lines as space permits ( Mar.25=9 mos. before Christmas, The Old New Year's Day, Christ's Conception, The Word Made Flesh, etc). Flowering or blooming teas feature a compact bouquet of long tea leaves with a dried flower in the center that opens in the hot water--these are usually white or green teas which allow the flower to be easily seen. They can be served as a beverage and/or enjoyed as a display centerpiece and make a unique carnation themed gift. For more see the links for flowering/blooming carnation tea as table centerpiece in the section on having an afternoon tea. Carnation scented or shaped soaps make lovely Annunciation day gifts. Most decorative are the mini carnation-shaped soap flowers. For larger carnation soaps see the section on carnation soap centerpieces for links to the items. For round carnation scent soaps, a 3-pack of 3.5 oz Roger & Gallet carnation soaps is available here or click here for the large 5.2 oz Roger & Gallet carnation soaps. For other carnation scent soaps scroll results or click the shopping tab at this link. Though somewhat uncommon, "carnation" perfumes and fragranced items are also available -- click the following link and scroll results or click shopping tab for a variety of options. Realistic faux carnations make a lovely and lasting gift for the occasion. They can be made of a variety of materials such as silk, porcelain, and resin (more photos here ), or mixed materials. Most readily available and least expensive are fabric carnations that can be used to make a homemade gift, or clay carnations can be made as an arts-and-crafts project using bakers' fondant carnation cutters--providing a symbolic activity to do with children each March as well as token remembrances of the day to give to friends and family -- the technique and supplies are almost the same as instructions HERE for making edible carnations -- just use clay as your material. Gardeners in particular may enjoy these Decorative Carnation Seed Boxes -- and see more photos here -- each mini decorative box of carnation seeds is topped with a silk carnation. Vintage images of carnation seed packets can also be found on other items and as framed prints. Other gardening gifts can include a simple carnation seed packet from a local or on-line garden store, or ready-to-plant carnations from the nursery. (These are especially appropriate since blessing of seeds, symbolic of new life, can be brought back as a traditional Annunciation Day practice). There are also color pictorial guides to growing carnations: Carnations and Pinks, by Pamela and Russell McGeorge (paperback) or (hardcover), or Carnations and Pinks for Garden and Greenhouse: Their True History and Complete Cultivation by John and Eileen Galbally. Pro-life activists will appreciate this hard-to-find book -- A Carnation a Day: A Pro-Life Doctor's Story -- by Mario A. Castello, M.D. -- reviewed on the EWTN website (click the link and scroll down to bottom of that page to the section, "Further Reading: The History of Abortion" -- (it is the fourth review). For writers, consider a blank journal with carnation-graphic cover. Make mini carnation seed packets for family and friends--using the directions and downloadable packet/ribbon sheet under Carnation Seeds for church distribution. For a quick method for kids, use a regular blank card and for the greeting, write at least one word of the text --"Incarnation"-- in non-toxic (school) glue and sprinkle carnation seeds on it as you would with glitter. Remember to include a note with each card that the carnation paper/seeds can be planted. The card can be decorated with drawn or clip art carnations. (If you are making a large number of cards consider buying carnation seeds in bulk on-line. To make your own carnation seed paper (a project that can be done with older children & teens), try Internet sites like this archived page on Plantable Cards or other instructions on making seed-embedded paper. Optional: You can add some pressed carnation petals for color -- for details click here. Tip: Instead of making the whole card of the handmade paper, just cut out a seed-paper insert and slip it in a slot you cut in a standard blank card (try cutting the insert in a carnation shape--if you'll be making many cards, make a cardstock stencil to trace). Small carnation plants (such as border carnations) can be bought in multi-packs at nurseries. Replant them in colorful but flexible plastic pots so they can be easily removed for planting in a garden. Wear the badge or pendant in March, and give badges, key-chains/pendants to family and friends, pro-life prayer groups, etc. For large buttons try using a large pink carnation graphic or photo as big as the badge and position text centered on it in a black font, or use smaller carnation graphics in the white space around text. For maximum impact extra large 3-1/2 inch clear snap-together badges that require no button machine are available in packs sold online and by the piece in some craft stores. The same style of snap-together buttons can be found in a smaller 3-inch size. Clear insert key-chains can be converted to pendants with a cord--for links to merchants that have these and other clear insert-items in various shapes and sizes click here. We have free downloadable carnation inserts with text in two styles: right-click to download/save 3 inch carnation badge inserts with feast day info, Incarnation text and DayOfTheUnbornChild.com web address, or right-click the following link to download/save 3 in. carnation badge inserts with Incarnation text and "Feast of Christ's Conception" -- 6 per page -- print in color. Make this carnation wreath at an archived site with real or artificial flowers to hang on your door as the feast day approaches--although labeled a "Christmas wreath," you can substitute pink for the red carnations to get a springtime look--follow the link or use other wreath-making instructions. If using artificial carnations you can use Styrofoam or dylite instead of florist’s foam. If you make a wreath with a large hole, consider making a round insert on decorative parchment-style cardstock printed with a greeting in a decorative font such as “Blessings on the Feast of the Incarnation” or “Feast of the Incarnation~March 25th” (see envelope-seal text suggestions for more). Check dollar/discount and craft stores for artificial carnations. Festive flags celebrate almost every season and holiday. Make a homemade flag or banner to display in your front yard throughout March to promote the Incarnation feast in your neighborhood using carnation graphics. Use weatherproof materials and include carnation images or sewn-on silk carnations with the text “March 25” and “Nine Months Before Christmas” in addition to the “Incarnation” feast name. For design ideas and options, see the suggestions for ordering a customized version on-line. Arrange real or artificial carnations in a teacup for a dainty gift or centerpiece (this is also a good way to use a lovely but imperfect old teacup that has crazing and is unsuitable for beverages). Small or baby carnations work best. Use real or faux greenery, twigs, or baby’s breath. If using artificial carnations, for this project consider the more realistic ones sold at craft stores rather than the discount/dollar store variety, and use a water-soluble glue to paste a Styrofoam base in the bottom of the cup in which to insert the flowers and greens. (If using real flowers, cut a round piece from a block of floral foam to absorb water and hold the flowers in place.) Then insert a floral cardholder (or make one by gluing a small piece of heavy paper to a wire or stick) with a card that says "Happy Annunciation & Incarnation Day!~March 25--9 Months Before Christmas" or "Celebrate the Incarnation~March 25~9 Months Before Christmas!" Use a decorative computer font to print out the card, or if writing it by hand, use a pen in a pretty color or metallic ink. For a baby-themed bouquet for your home, use pink and white carnations and dye the white ones blue -- follow the link for more details. This fun activity is a nice way to start family-based Spiritual Adoption on the Incarnation feast--but get the flowers two days ahead as it takes time for them to absorb the blue color. Baby carnations, if available, nicely fit the theme. Basically, you will cut stems under water taking off about 1 inch, and mix blue food coloring into warm water for the dye--flowers should be fresh when dyed and it is best to use a floral preservative or a little sugar in the water. The color will deepen over hours or days, and when it reaches the desired shade, transfer them to clear water with the pink carnations. Several web sites give instructions for making paper carnations using gift/craft tissue paper -- for crepe paper carnation directions click here. For a more realistic look, cut little v's or slits in the edges of the paper that will be opened into the petals (you can try a zigzag scrapbooking type scissors). [The directions are very similar to making flowers out of facial tissues for decorating cars, etc. If you know this method, simply substitute 4 layers of gift-wrap tissue cut into rectangles (try cutting them the size of a standard sheet of paper), then make lengthwise 1-inch fan-folds along the 4-ply tissue back and forth until you have a thick strip about 11 inches long, then fold in half and staple at base, and cut opposite ends into frilly petals with short slits or tiny v-cuts, then gently separate and open petals, and for a stem insert wire (or two long green pipe cleaners twisted together for strength) in base (younger children may want to tape a green wooden stick such as a plant stake to the flower base instead) and wrap with green floral tape in overlapping spirals starting just under petals and down the wire.] For young children there are instructions for simple cupcake-paper carnations that have the crinkle v-peak edging ready-made. Soap or candle makers can use the carnation molds such as those HERE -- or small carnation molds HERE. (Note that some of the smaller molds can make decorations, wax melting tarts, or mini soaps). Click for carnation candle scent, or carnation scent to make soap/bath products or potpourri. You can also make regular bar soaps or wide candles and apply a carnation graphic using computer printer decal paper for candles and decal paper for soap. Also click here to see the molds for carnation chocolates -- some of which are listed as wax/soap compatible. Craft stores have soap-making kits/supplies for clear soaps with silk flower petals inside--use carnation petals from carnation lei flowers cut into wedges--available at party stores or buy artificial carnation leis online. 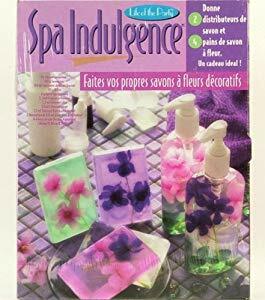 Click here for a bar and liquid soap kit for silk flowers (carnations not included) or here for glycerin bar kit. If you want to try it without the kit you can just buy the pour/melt bar clear soap and then use general directions for "flower embed soap" here, or for the liquid soap with faux flowers/petals click here for instructions (archived site--NO online ordering) and check this link for Liquid Suspension Soap. View photos of how beautiful finished products can be here (clear bar soap) and here (liquid soap bottle) or for both types be click HERE for a photo of the Spa Indulgence kit -- just picture how they would look with carnations. Note: For a liquid soap quick and inexpensive method: Find an attractive shaped bottle of clear hand soap with no color that has all writing/markings on removable labels -- peel off or remove labels with adhesive remover if needed to get residue off (tape may lift off some adhesive residue; Goo-Gone or hand cream can be used to dissolve remainder, just apply, wait a few minutes, and rub off with rag). Cut artificial carnation petals from faux flowers or leis (dollar or party stores) and drop in bottle -- just enough for appearance -- not enough to clog. Use soap pump shaft to move petals inside of bottle so they are spread evenly. You can design your own with a home publishing program, or click HERE to view and use/e-mail our card graphics, or to download a print version for note cards and postcards click HERE. Once mailed, an envelope may pass through many hands and seals are a nice way to promote the feast. Several banners on our site feature a carnation and can be downloaded from our web banners page. Another option is to make your own on your home computer with ink jet/laser labels and carnation clip art or photos, giving you a variety of size, graphic and font options--see text suggestions below. Commercially available ready-made carnation labels to which you can add your own March 25--Incarnation text are hard to find, but Zazzle has several carnation-design products that can be customized with your own message text -- click here for a pink carnation sticker or here for other carnation sticker/labels. You can also design and order them online at custom stationery stores -- searching and inserting a carnation graphic from their stock images as with Vistaprint. For a fun and affordable custom color option at Vistaprint you can choose a Return Address Label (click HERE) with 4 lines for your Incarnation text and insert a white carnation that can be changed to almost any imaginable color -- Here's how: when you start designing, click the image icon and then choose image library to search -- type in: white carnation -- and click the search icon -- when you get the image results and click the image of the white carnation, it will appear in your design and then you can click/drag to move and click/drag the corners to size the flower -- then click the color button to drag to any shade you like -- from bright peach, to the subtlest blush, or classic pink (other buttons will change brightness, intensity etc.) -- When done changing the image, you can click the text button to change size and style of font for your text on the Incarnation. (Other carnation images may be added to their image library, but keep in mind that a large image of a single carnation or close-up will work better on affordable small return address labels.). Another option is custom Round Envelope Seals -- but it may be more challenging to work the carnation graphic and text into that shape. Text ideas should emphasize “The Incarnation” in the first line of text to connect with the visuals, and perhaps have the old feast name “Festum Incarnationis” as the last line. Just as you would send Christmas cards, you can observe the Annunciation feast by sending Carnation-themed cards focused on the Incarnation. The flowers serve as a symbolic reminder of the day's true meaning, and carnation-themed invitations add a nice touch to an Annunciation or Day of the Unborn Child event, as do thank-you notes for volunteering at the events--you can add real or faux carnation petal confetti as described below. And carnation envelopes with text on the feast day can be used for all your March mailings. You can design these with your home publishing program, or create and order them online with the links below. Arts & Crafts Activities Tip: If you have fresh carnations in your home for the feast day, instead of throwing faded flowers away, remove the freshest most colorful petals and press them flat--use as confetti in carnation-themed March 25 cards, or as described below, to make pressed flower Incarnation Day greeting cards to send next March. To view the card graphics click HERE. Right click the following links to download/save a file to print complimentary note cards or postcards (front graphic, blank inside)--color carnation drawing with text in oval frame (can print in fast/economy mode to save ink for a pastel effect) (in Word format) or one featuring an actual carnation photo with overlaid text (in Word format). File prints two cards on a standard size sheet--cut exactly in half at the 5-1/2 inch mark and fold for two invitation-size folded note cards. For postcards you can use the same file, just print, then flip or turn to print again in the blank side of sheet -- then cut in quarters. For best results use heavyweight paper or cardstock--white, cream, natural work well. Print and cut a test sheet first before multiple copies. Note: These printable cards are also available as free e-cards--see the section on carnation themed e-cards. You can make your own with inkjet or laser cards/envelopes and clip art carnations or photos you take yourself. You can even try scanning a real carnation (this is a fun activity for kids). Before discarding carnations, remove well-formed colorful petals with the characteristic "spikes" and press them flat for use next March in pressed-flower Incarnation cards, envelope seals, and as confetti. Cut standard size heavy paper or cardstock sheets in half horizontally and fold each in half vertically to make two cards to fit invitation-size envelopes. At the top and/or bottom write appropriate text for the "Incarnation" (Annunciation~March 25th/Incarnation Day/9 Mos. Before Christmas) with a colorful marker, glitter or metallic pen. With small brush apply liquid glue to flat dried petals and paste to front in a flower pattern in center. Or, for more durable cards and mailing seals, make carnation stickers to decorate front of blank cards and envelopes--brush liquid glue on dried petals or dot glue stick on regular thickness paper in desired small patterns, paste petals down, let dry, cover with wide clear mailing tape, and then cut out shapes without cutting close to petals (leaving more than 1/8 inch paper border around them); run them through a sticker machine or paste them to the front of cards between top and bottom text and one to the back of sealed envelope. Extra petals can be scattered inside cards as confetti. Internet printers allow you to create custom cards by searching an inserting one of their carnation images -- Vistaprint for example. You may have to start with a blank template. For the text, simply flesh out the ideas for Carnation seals above with appropriate slant for the type of card--feast day greeting, invitation, or thank-you. [Note: For an added touch of “confetti” in cards, freeze dried or dried carnation petals (see the "Setting the Table" section) or artificial petals from artificial carnation leis cut into wedges, can be used as confetti in carnation themed cards and invitations to Feast of the Annunciation or Day of the Unborn Child events--consider using your own pressed petals from last year's carnations.] You can also make customized carnation-theme envelopes (with room for your own text front and/or back) to use all through March to promote the feast -- Vistaprint envelopes -- size 9 are good for most mailing needs (large enough for a standard sheet folded in thirds), or they also have invitation and greeting card envelopes. (If you’re more ambitious you can design matching cards and envelopes from scratch at Vistaprint. Please first see our Q&A on the importance of attending your church’s official Annunciation Feast celebration in years when it is moved from its given date of March 25th. This often happens, for example, in the Roman Catholic observance owing to Easter conflicts (in such cases when moved only one day ahead it might be possible to attend or arrange an evening mass at or after sundown the night before, which would be the 25th by the calendar but the 26th liturgically speaking.) In those years when there is a change, March 25th can still be an occasion for preparatory activities leading up to the feast day, private/family gatherings and prayer, as well as special pro-life events that will promote the upcoming celebration of the Annunciation. When the celebration of the feast is postponed, set March 25th aside as a day to prepare decorations, bake carnation cookies, or make homemade gifts/crafts for the official celebration days later. Or simply make prayerful preparation by lighting a candle placed near a carnation, reading the Bible passages on the Annunciation, and saying a special grace before dinner that night. Public observance in years when the feast is moved presents both a challenge and an opportunity. One approach is to link the days with two special events (the first promoting the second) and to make use of the interval to reinforce the feast’s Incarnational meaning and pro-life import. Take advantage of the intervening days as additional opportunities to encourage attendance at the official celebration of the Annunciation and to raise awareness about the feast’s Incarnational significance and its pro-life emphasis highlighted in the Day of the Unborn Child observance. One option is to use the two occasions of March 25 and that year’s transferred feast date to emphasize different aspects of the feast of Christ’s conception. The 25th could be set aside for a more solemn memorial or ecumenical service to gather in prayer for the unborn and for success of the Day of the Unborn Child in raising pro-life awareness, while the official Annunciation observance could have the celebratory character of a feast day giving praise and thanks to God for the gift of the Incarnation in the conception of Christ. In years in which the feast is moved, the Day of the Unborn Child is oftentimes celebrated on the same day to which the Annunciation is transferred. However, in other cases the Day of the Unborn Child events are still held on the 25th while promoting attendance at the upcoming feast day events. For example, a pro-life prayer service on the 25th to pray for an end to the culture of death and the success of the Day of the Unborn Child can also highlight the importance of participating in the upcoming celebration of the feast day, which might simply be to attend one’s parish mass for the Annunciation. Regardless of the approach, the first event is an opportunity to promote the second with brochures, signs, and/or announcements, and at both events the gestational interval between March and December 25 (and the reason for the current year’s move of the feast) can be pointed out. One simple, positive, and practical way to bridge the gap between the two dates is to have a baby-item drive that accepts donations from the 25th through the day on which the feast is being observed. This not only benefits the needy via a local pro-life charity/pregnancy center but also informs the congregation about the life-affirming significance of these days as well as providing an occasion to promote attendance at the concluding Annunciation mass and/or any related events--a sign on the collection bin and a nearby info table can give date and times and some brief historical facts on the feast. A closing after-church get together with refreshments could be offered in keeping with the "feast" day and as a thank you for donors. Other examples of multi-day events that can underscore the importance of this feast are conferences, parish missions, retreats or a lecture series with a pro-life/Annunciation/Incarnation theme. These can make productive use of some or all of the intervening days with a different focus on each day. For example, a three-day series could focus on the awe-inspiring mystery of Incarnation at Christ’s conception, the pro-life implications of the feast chosen as Day of the Unborn Child, and considering the Lenten/Easter season one might highlight the Incarnation in relation to the Passion and Resurrection (see the Annunciation Church/School Program for materials on Lenten meditations for the Annunciation and prenatal life of Christ). For Catholics one topic could focus on the Incarnational aspect of Christ’s conception as a Rosary meditation subject for the Annunciation as the first of the Joyful Mysteries. Homemade “FirstDay” cards can be made at home or as a school project to remind us of the day when Christ the Eternal Word became man. Children can draw the angel and/or a dove over Mary with a halo around her womb. A cake can be decorated similarly or simply with “Happy FirstDay Jesus!--March 25th” Click the following links for more info on (FirstDays campaigns begun on the Annunciation) and the celebration of (FirstDays) plus a (downloadable FirstDay card). Make a “FirstDays” calendar marking the days that fall nine months before loved ones’ birthdays. Use the calendar as a reminder to give little gifts or treats to friends and family on their special days in the coming year. A “FirstDay” card can be made to use alone or to accompany a gift and explain the occasion (the front can read “What day is your March 25th?”). Alternately, the card can simply ask the recipient to guess the reason for the mystery gift or card--try decorating the front with a question mark, and be sure to include the day and month on the card, especially if you are mailing it and aren’t sure what day it will arrive. Click the following link for info on our downloadable FirstDay card for all ages. (Click here for more information on starting a FirstDays campaign to coincide with the Annunciation feast). On March 25th begin a 9-month countdown calendar to Christmas, constructing it out of one sheet of colored paper folded in thirds both ways to create nine equal squares. Mark the first square with the feast date March 25 and write the current and past names of the feast underneath (Annunciation, Incarnation, Conception of Christ), and the last square marked Christmas--December 25. Do something special at the end of each month as you mark them off. An Annunciation themed movie for children can be a fun way to bring the day to a close. If you prefer a recent mainstream theatrical release, note that the Annunciation was featured in the 2017 animated film "The Star" -- it begins with a depiction of the Annunciation with words appearing on the screen to remind us that the time and place is Nazareth, 9 Months Before the first Christmas -- an opportune moment to pause the video and read the text aloud to young children. Watching the first part of the film in March (and then the whole in December) can become a memorable family tradition to prepare for March 25th -- the animal characters include a little cartoon dove and have broad appeal for kids. The film is available on DVD or can be rented online with a free sample video clip -- click here for more including links to a review that mentions the unique "9 months before Christmas" opening. See suggestions under this topic under Adults and Families. Start using the signature at the beginning of March. Save one of our Annunciation-themed banners as your screen background for March. Show family and friends how they can do likewise. Right-click the banner above to get the menu option to save picture/image (or set picture as background) -- if saving the image first choose desktop as the location -- then go to the image on your desktop and right-click to get the option to set picture as background. For phones/tablets touch and hold the banner above to save -- then go to the saved picture and use your tablet/phone's option to set as wallpaper, (which may be a menu option when viewing the saved image, usually accessed by touching or dragging down the upper right corner of the screen). Visit our Web Banners page for additional images to choose from. Use Twitter, Facebook, etc. to promote the Annunciation well in advance of the feast day. Include basic info on the feast as the traditional day honoring Christ's conception/Incarnation, its older names Festum Incarnationis/Conceptio Christi and history as the pre-Gregorian New Year's Day, and especially the symbolic gestational nine months between the March 25 feast date and December 25. Include links to relevant sites and practical suggestions on celebrating the day (as with prayer, church attendance, and/or a fresh carnation for the dinner table). Then make sure to post or tweet a "Happy Annunciation Day" greeting on March 25th. You might also consider using these sites/apps to form groups for nine-month spiritual adoption from the Annunciation to Christmas, or an all-year 25th-of-the-Month-Club for prayer and sharing info and ideas on promoting the feast day (groups can be local based on city, church or school, or draw from all social-networking contacts with similar interests)--prayers/suggestions/reminders could be shared & posted/tweeted every 25th of the month (visit the 25th-of-the-Month-Club page with tweetable tips, and click here to use the colorful promo banner). You can also follow us on Twitter and Facebook for easy promotion (see homepage for direct links). Design E-cards with a March 25th theme (either the Annunciation or Day of the Unborn Child) and send them a day or two before the feast. For ideas on design and text use same links in paragraph above for regular printed cards. For free, ready-made Annunciation e-cards, see the e-card and banner page. Festive outdoor banners and flags celebrate almost every holiday--why not display one in your front yard for the Annunciation feast from the beginning of March until the day is celebrated--either craft your own homemade version or order a customized banner on-line using your own uploaded graphics. For banner flag, feel free to save and use our oval-carnation-frame or Annunciation/Christmas e-card graphic (both are portrait orientation and have black lettering) found at the web banner page (you can then upload it to make a photo flag banner at the mini banner link below which allows smaller file sizes, or any site that allows you to customize your own flag banner) -- the carnation design is nice for spring and the Christmas-theme design can be worked into your holiday decor. You can also design your own -- For example: A simple banner/flag design would include a decorative border and an attractive yet easy to read font for the text: March 25th at the top, Nine Months Before Christmas at the bottom, and the feast name in the middle perhaps in a contrasting color, italic or font. You might add a simple graphic. For example, if using an image of Mary with an angel or descending dove, work the title Feast of the Annunciation in among the images. Or, you might use carnation flower graphics appropriate for the springtime season, using instead the older title Feast of the Incarnation among the carnation images. If you are making a large banner, carnations can be used as a wide border, or to add dimension, sew-on a few fabric carnations. (Don't worry about depicting the unborn Christ in your graphic--the "9 Months Before Christmas" text will communicate the feast's meaning.) For photo upload banners, graphics can be created on a home publishing program and then converted to the desired file type with the "save as" option. Click here for a mini flag banner you can customize -- approximately 12.5 x 18 inches and hangs vertically -- (if creating your own design, for the mini you may need to use the abbreviation 9 Mos. Before Xmas). During the ordering process you will be asked to upload your graphic in one of the following types: JPEG (.jpg, .jpeg), TIFF (.tif, .tiff), or EPS (.eps). The pole for the mini can be purchased at the same online store or check at local flag/banner stores such as Flagtastic. On March 25th, do an electronic version of the family & friends “FirstDays” calendar. Set reminders on electronic organizers and computer calendars to send “FirstDay” or “Life-Day” cards, e-cards, or greeting cards on the days that fall nine months before (or three months after) the birthdays of family and friends. Click the following links for more info on FirstDays campaigns begun on the Annunciation and the celebration of FirstDays including our download to print FirstDay cards for all ages. The text suggestions above for badges and e-mail signatures can also be used on bumper stickers and window clings. If you would like the sticker/cling to cover both the Annunciation and Christmas, consider the text/design suggestions for Annunciation/Christmas shirts and badges. Bumper stickers can be custom ordered at several websites such as Staples, but a less expensive option is print-at-home bumper stickers are available in many styles including ink jet sheets, and these laser printer sheets that you print on the cardstock setting -- formatting is easier on full sheets that can be cut to desired size as explained on this site that has both laser and inkjet types as well as products for complete waterproofing. Window clings are available in both non-adhesive and repositionable adhesive varieties. Click here and scroll down for low tack clings in both clear and white. Click here for both static and ultra low tack clings in clear and white. Provide clings/bumper stickers for pro-life groups, information tables, etc. Scripture reading is one of the simplest and most poignant ways to honor the day. Set aside some time to gather together, perhaps before or after dinner, and read aloud the verses on the Annunciation and prenatal meeting of Jesus and John (Luke 1:15 & 30-44). Children old enough to read can participate by taking turns. Close with a prayer of thanksgiving for the incomparable gift of the Incarnation and for all unborn children. Mark the occasion with a special touch like placing a fresh carnation on the table, or lighting a carnation candle. Note: Catholics may also want to read relevant passages from the 1994 Catechism, including: 717--"John was 'filled with the Holy Spirit even from his mother's womb' by Christ himself, whom the Virgin Mary had just conceived by the Holy Spirit. Mary's visitation to Elizabeth thus became a visit from God to his people"; 486--which alludes to the fact that Christ's birth is part of the gradual "manifestation" of the Incarnation that had already taken place at the Annunciation; 495--"Called in the Gospels 'the mother of Jesus,' Mary is acclaimed by Elizabeth, at the prompting of the Spirit and even before the birth of her son, as 'the mother of my Lord,'" revealing that life, motherhood, and Christ’s divine personhood are present at this very early stage of pregnancy. Save one of our Annunciation-themed banners as your screen background for March as a reminder to you and others who see it -- visit our Web Banners page for many images to choose from with varied emphasis (historical, religious, pro-life) for various settings (workplace/school, church, home). Right-click the banner to get the menu option to save picture/image (or set picture as background) -- if saving the image choose desktop as the location -- then go to the image on your desktop and right-click to get the option to set as background. For phones/tablets touch and hold the banner above to save -- then go to the saved picture and use your tablet/phone's option to set as wallpaper, (which may be a menu option when viewing the saved image, usually accessed by touching or dragging down the upper right corner of the screen). Contact your local pro-life pregnancy center and ask what items they need. Purchase and/or deliver these items (diapers, bottles, baby clothing) on March 25th. Send out Annunciation snail-mail and e-mail cards as you would Christmas cards. Download/save our free Annunciation cards and print them yourself--one covers both Christmas and the Annunciation, and two feature carnation graphics to symbolize the Incarnation with text on the significance of the March 25th date--plus all the web banners can be downloaded as top fold note/post-cards. To e-mail ready-made Annunciation e-cards and e-greetings, click HERE. Commercially available cards are another option. Art galleries often offer greeting card versions of their Annunciation artworks--for example, the Metropolitan Museum of Art--enter the term Annunciation in the store search box (note that some feature Annunciation text while others have Christmas greetings). This one featuring Annunciation artwork includes the verse "Wishing you all the blessings of the season" -- which can be used both for the Annunciation and Christmas. Click the following links to see one with only Annunciation themed text: "Annunciation-Illumination". With store-bought cards, use Annunciation-Christmas labels with the cards or write your own note pointing out the nine month Mar.25/Dec.25 interval. Stickers and seals with info on the Annunciation and the nine-month interval between the feast date and Christmas can be used on mailings throughout March. If you use text that stresses the Christmas connection they can be used throughout the holiday season as well. These and many other styles can be found on our web banner page, which features downloadable files to print our various graphic banners as seals/stickers. You can also use do-it-yourself inkjet/laser adhesive label sheets to design your own with a home computer. But one easier way is to purchase custom made address labels, which can be ordered with any text you choose. For Annunciation envelope seals that stress the Incarnation please also see the suggestions in the Carnations for the Incarnation section. For a more festive look these graphics work for both Annunciation & Christmas -- the 4-line 26 character golden bells (also good for New Year’s), and the blue singing angel. Celebrate the feast at home with a special dinner and invite family and friends. In a vase or centerpiece, use carnations (the word means flesh-colored flower) in honor of the Incarnation--offer flowers as take-home favors and if desired, attach paper or fabric ribbons marked with feast date info. Or, give each guest a small imprinted favor as described in gift recommendations below. Especially if children will be present, have a special cake or cookies marked with the date in icing. The invitation alone will help spread the message, regardless of how many accept. Click here for more ideas on a carnation-themed dinner, party, or tea. Carnation-themed or imprinted items make meaningful gifts for the occasion. Many small items can be ordered with a line or lines of text with info on the day. MonasteryIcons.com offers small plaques (3x4 in., or 4 1/2 x 6 in.) with Annunciation artwork that can be personalized with your message on the meaning of the March 25 feast -- (minimum order of 50, good for commemorative gifts for special pro-life events) -- click here to view their virtual catalog -- (see pg. 30 & 31 for Commemorative Icons). Use code 442CI for small, and 442CIM for medium -- submit orders via mail, email or fax -- find their e-mail web-form and other contact info here -- printable order form is pg. 28 of the virtual catalog -- (for text ideas see the label suggestions section and scroll down for several 3-4 line examples). For inexpensive gifts to hand out to students one suggestion that’s sure to be a keeper is heat-sensitive color changing pencils--this set can be personalized on-line but allows only 30 characters, or if sold out try the set with holographic stars and easy to read text/background (to save space separate the words with capitalization rather than spaces and write the line equation style to show the interval between feast days). 1. Start early in day. (If desired, cake may be baked well in advance of use, cooled thoroughly, and stored tightly wrapped in freezer.) Soften yeast in the warm water. 2. Mix butter, salt, sugar, eggs, lemon peel, almond extract, egg yolks. Add the yeast and butter mixture to 2½ cups of flour and beat with electric beater. Remove beater and add as much of the remaining flour as needed to make a very soft dough. Grease your hands lightly with butter and coat them with flour. Knead dough on a lightly floured board till smooth and free from stickiness, adding only as much of the remaining flour as needed to make a very soft dough. Knead in raisins and apricots and continue to knead till dough becomes silky and stretchy in texture and bubbles or blisters appear. 3. Place dough in greased warmed bowl, turn dough once to grease top surface, cover with a towel and let rise in a warm place, such as the top of a radiator, until doubled in bulk, i.e. one to two hours. If dough does not double in bulk in this time, knead again and repeat rising process. (If necessary, punched-down dough may be covered and refrigerated overnight and the rising continued the next day. 4. Knead dough again till smooth. Separate out a lump of dough large enough to halfway fill a greased and floured two-pound coffee tin. Insert wax-paper-wrapped coin into dough. (Any remaining dough may be baked in muffin tins.) Brush tops of loaf with melted butter and let rise again until doubled in bulk. The dough should just reach the tops of the pan. With a razor or sharp knife cut a deep cross in top of loaf. of the pan and rings hollow when thumped. 6. Cool thoroughly upright on rack before serving or storing. 7. On Annunciation day, decorate the cake with small Christmas-crib figures of Mary and the angel and four white candles. The Christmas message “Gloria” on the angel’s banner may be painted out with acrylic paint and the Annunciation message “Ave Gratia Plena” written on the banner with a fine-tip indelible pen. The angel may be suspended from its hook on the notched end of two large matchsticks which have first been spliced together with masking tape and the unnotched end inserted in the cake. Or, if desired, the angel may be suspended with thread from a chandelier above the cake. 8. Cut a crown from bright green poster board, stapling it together in the back. Cut tulip shapes out of red and pink construction paper; cut stems and leaves out of yellowish green paper. Paste or staple the tulip shapes around the outside of the crown alternating red and pink tulips. At dessert time light the candles and sing an Annunciation carol before cutting the cake. The person who finds the coin in their slice receives the flower crown to wear. The coin signifies that Christ has bought us; the flower crown signifies the bliss of heaven which Christ won for his people. Annunciation day marks the beginning of our redemption for it is the conception day of Christ. [Recipe contributed by the Annunciation Society]. Note: Our “Prayer to Christ Unborn” page has downloadable files to print text-only March 25 prayer cards and brochures, as well as a display sign explaining the day’s significance for billboards, informational tables, etc--color signs featuring our banner images are also available via the web banner page. Perhaps the simplest way to promote awareness of the day is to have an after-church coffee and refreshments get-together on the Sunday before or nearest the feast day featuring an info table with the downloadable sign and prayer cards and/or brochures--this can easily be combined with a baby item donation drive for a pro-life charity. [In addition to prayer cards and brochures, consider handing out small all-ages gifts such as pencils (click for details) with information on the day and its significance that will remind attendees of its meaning]. (Please see the home page section on how the Annunciation provides a uniquely child-friendly introduction to the meaning of conception and the sanctity of life--particularly helpful in teaching those children too young for the details of human reproduction. See also the suggestions for Spiritual Adoption and the Annunciation/Christmas/New Year's Connection). Plan a sermon for the Sunday before March 25th that addresses the importance of celebrating Christ’s conception as the moment of Incarnation to raise awareness of the day ahead of time. Invite the congregation to stay after the service for an Annunciation-themed prayer of thanksgiving and praise for the gift of the Incarnation. For example, Catholic parishes might pray the Rosary's Joyful Mysteries after mass, with emphasis on the first two--announcing the first mystery as "The Annunciation--when Christ was conceived" and the second as "The Visitation--when Mary with Christ in her womb met Elizabeth and her unborn son John." If your church already has a daily service for the feast, encourage member of the parish or congregation to attend, and also mention any other Annunciation/Incarnation celebrations or Day of the Unborn Child events in the area, making sure the details are printed in the bulletin and/or posted on fliers. If your denomination does not specifically celebrate the Annunciation, write a piece for the church bulletin/newsletter on March 25th as “Day of the Unborn Child” and/or the compelling reasons to celebrate Christ’s conception and the logical symbolism of doing so nine months before Christmas. If time permits, plan one or two events that emphasize either or both aspects--a simple prayer service on the day to pray for renewed respect for all human life, and a grateful celebration of Christ’s Incarnation. One popular approach is to begin a nine-month Spiritual Adoption program on the day to pray for the welfare of newly conceived children. Some Catholic parishes select the Annunciation feast date to start a "novena" of monthly Masses (the Annunciation Society offers monthly meditations on Christ’s development in the womb to be used from the Annunciation to Christmas--right click to download/save the "The Nine Months of Jesus in the Womb--Mar.25 to Dec.25). This approach also reinforces the nine-month interval before Christmas and can stand alone or complement a Spiritual Adoption program--each Mass can be offered for a specific monthly intention concerning the physical, spiritual, and familial welfare of the "adopted" children. Please also see Worship Resources, and An Ecumenical Celebration for traditions and sermon ideas from particular denominations. One simple and practical way to highlight the pro-life aspect of the day is to have a baby item collection drive promoted ahead of time in the bulletin and with postings. Contact a local pro-life pregnancy center or charity and ask them for their current needs list. Have the collection bin in place on the morning of the Sunday before the feast day--attach a sign or flyer to the bin specifying the items wanted and giving basic info on the upcoming Annunciation feast--that it honors Christ’s conception and falls nine months before Christmas, as well as its designation as Day of the Unborn Child--a special time for charity towards unborn children. If there is room on the bin, also attach a flier with the time/location for any special events for the day, or an adjacent info table might offer flyers for local Annunciation or Day of the Unborn Child events as well as prayer cards. For sign ideas and downloads see text-only versions at our prayer page or banner image versions at the web banner page. Another option is a carnation sale fundraiser to remind us we are celebrating the Incarnation and to provide financial support to a local pro-life pregnancy center reflecting the feast’s designation as Day of the Unborn Child. The sale and its purpose should be promoted in advance and can be combined with a well-attended Annunciation event, or on the Sunday nearest to the feast day to maximize the response. An after-church get together with refreshments and a literature table is another way to spread the news--this can be on the Sunday before, combined with the start of the baby-item drive, or on the feast day itself after a church-based event--either way, make sure it is publicized in advance in the bulletin and with posted fliers. This needn’t be costly--simply offer coffee, tea, and donuts, or ask parishioners to provide baked goods. Additionally, consider that many churches have regular spaghetti dinners or fish-fries--simply adjust the timing of a seasonal dinner to celebrate the Annunciation, or begin a new tradition specifically for the feast. A parish dinner can be held after church services on the feast date to encourage more people to attend, or if vigils are celebrated it can be held the day before--for example, a 6 p.m. mass on March 24th followed by a 7 p.m. dinner. A portion of the funds raised might be donated to a local pro-life pregnancy center. On the day itself (or Sunday nearest--preferably before), one option is to distribute prayer cards and/or brochures focused on the conception of Christ, the welfare of the unborn, or both (for downloadable materials see our Annunciation pro-life prayer cards page). They can be handed out after the service or mass, or displayed along with a refreshments table. An essay contest with a pro-life theme or Christ's Incarnation at the Annunciation can either begin or end on the March 25th Annunciation, with fliers reinforcing the significance of the feast of Christ's conception and the symbolism of it being 9 months before Christmas. For example, in 2015 the Catholic Diocese of Green Bay, WI had the wonderful idea of starting their contest on the solemn January 22 Roe v. Wade memorial and ending on the joyous Annunciation feast -- see the link here. Alternately, if schools want to time their essay contest for later in the year, they can begin taking entries on the March 25th Annunciation and end on Mother's Day in May. Also see the "Fairy Baby Contest" section. The following titles are offered or recommended by the Family Resources Center of the Peoria Diocese Respect Life Board for Annunciation observance and celebrations, specifically their Annunciation Church/School Program, and for 9-month Annunciation-to-Christmas spiritual adoption programs. Many of these materials are available free of charge at the Family Resources Center. Another Peoria Diocese Respect Life Board publication, “Life Is a Miracle: Families Celebrate March 25, the Feast of the Annunciation,” has additional ideas, reflections and suggestions for celebrating the feast. It includes books, songs, videos, prayers and more. The booklet can be ordered on-line here or call the Family Resources Center at 309-637-1713. NEW: 14-page booklet by Kathleen Curran Sweeney entitled, "The Life of Jesus In The Womb: A Meditation and a Prayer" enhances Annunciation-launched spiritual adoption programs--available via One More Soul. (Cover shows Christ saying "This is my body…" offering the spherical communion host juxtaposed with a color photograph of a spherical human zygote). One More Soul can be contacted via www.omsoul.com -- 800-307-7651 or 800-307-7685. Contact the Family Resources Center at 309-637-1713. NEW: Annunciation reflections booklet includes Play for Student Performance on the Annunciation entitled, "Celebrating the Annunciation and Incarnation of Jesus"--published by One More Soul, available via OMS or the Family Resources Center. This companion to the Annunciation Church/School Program offers an additional option for celebrating the day. Perfect for parish and school-based observance of the feast, this booklet includes reflections and thoughts of Biblical figures, suggestions for prayer and Rosary meditations (particularly the Joyful Mysteries), and an Annunciation-themed play that can serve as a counterpart to the familiar Christmas plays that bring the events of Christ's early life to the young performers and family members of all ages who attend in a way that leaves a poignant memory for all. In addition to print copies of the play, a DVD will soon be produced (contact the FRC for availability). One More Soul can be contacted via www.omsoul.com -- 800-307-7651 or 800-307-7685. Contact the Family Resources Center at 309-637-1713. Companion Poster Set (for the Annunciation Church/School Program the Family Resources Center recommends this set of 10 laminated posters spanning the 9 months of pregnancy showing month-by-month prenatal development -- order the series that begins with the moment of conception -- the text for the first poster reads, "I'm here!"). Available from Heritage House '76, Inc. -- visit http://www.hh76.com -- or call 1-800-858-3040. These can be tied into Annunciation-based spiritual adoption of the unborn and the booklets above, especially "Jesus' Journey in the Womb" and the 10 "Jesus in the Womb" reflections in an attractive printable format are included on a CD of document files for the Feast of the Annunciation Church/School Program available from the Peoria Diocese Respect Life Board's Family Resources Center -- the first poster and reflection are used for the Annunciation, and the last for Christmas, while the remaining 8 cover the intervening months. For more info, e-mail famresct@mtco.com or call 309-637-1713. Another popular approach is to have an Annunciation/Incarnation diner, luncheon, or conference with a guest speaker on the Incarnational and/or pro-life aspect of the feast day--a portion of the price can be donated to a local pro-life pregnancy center. Note: If one large event is planned for a locale or diocese, a church or school named for the Annunciation or Incarnation can be ideal if conveniently located. Note: See Our Web Banners Page for Promotional Graphics for Both Initiatives, and follow us on Twitter and Facebook for easy sharing of graphics (see homepage for direct links to "follow" and "like" us). Choose Annunciation Day to launch a “+9” or “Celebrate FirstDays like BirthDays!” campaign--promoting the slogans throughout the nine months leading to Christmas--a clever catchphrase like "Count From Conception Because You Count From Conception" can be added to further define the initiative. Each poignant but pithy phrase focuses positively and appealingly on the prenatal life of the person reading or hearing it, rather than directly on the victims of abortion. Both are premised on the idea that if people understand the inherent value of their own lives including the first nine months then they will recognize the inherent worth of others including the unborn. “Plus Nine” reminds us that our legal age is not our real age, and “FirstDays” give us a new reason to celebrate. The mottos gently imply and open the door to the more direct follow-up affirmation that “You matter--from conception!” Short enough to print on signs, stationery, and in each issue of church bulletins/organization newsletters, they can be paired with the URL of a local church or pregnancy-center webpage updated to feature info on the meaning behind the catchphrase. Toward the end of each of the nine months (preferably on the 25th) there might be a new focus or venue added, or a special promotional activity such as a +9 bumper sticker giveaway, school essay contest on the slogan’s meaning, or student art show to select the best “Celebrate FirstDays” sign. These simple consciousness-raising efforts reach out to a broad base of varying ages and ideologies, including those who might turn away from more explicit anti-abortion messages--ranging from the young child innocent of the reality of abortion, to those post-abortive parents trapped in denial, and even the longstanding pro-abortion activists who never consider the fact that they themselves were once unborn children. These approaches also can serve as entry-level forms of pro-life activism. Reflecting on our own prenatal life has the additional benefit of enriching the pro-life perspective of those who already oppose abortion. NOTE: Internet postings and e-mail signatures offer expanded opportunities to spread the slogans, and smaller versions of the signs can be produced on bumper stickers, magnets, dorm/school doorknob hangers, and envelope seals for wider distribution--all these formats are also available on home printing specialty papers allowing individuals and families to further promote awareness. For additional suggestions and background info, see the respective sections with downloadable signs below. Begin a “+9” campaign with the posting of boldface +9 signs that serve as thought-provoking and life-affirming reminders that we are all nine months older than our legal age. [Also see our Web Banners page for printable cards, stickers, signs and e-graphics for the "+9" initiative, and follow us on Twitter and Facebook for easy sharing of graphics -- see homepage for direct links to "follow" and "like" us.] As profiled in Human Life International’s Dec. ’06 Special Report No. 264, the “plus nine” campaign is a “brilliant and simple educational concept to underscore the value of human life from the moment of conception”--“catchy, attractive, and effective.” It is also ideally suited for children, whose desire to be and think of themselves as “older” can now be channeled into a positive and reality-based understanding of their own worth from conception. It is especially important to teach this lesson to vulnerable preadolescents, whose eagerness to “grow up” can easily be exploited by a media which continually bombards children with corrupting content promoting destructive ideas and behaviors at increasingly younger ages. Particularly well suited to school-based programs, it can be implemented for and by students, posting and making +9 signs. HLI reports that Paul Vincenti of Gift of Life (click & scroll down to see and read about their +9 web banner) and a co-worker conceived and developed the idea for a pro-life campaign in Malta where these signs posted on “walls, trees, and lampposts,” combined with the practice of adding “plus nine months” to the answer when asked one’s age, have effectively raised awareness of the fact that life begins at conception. This fact of our real age has been reflected at times in various cultures. For example, EWTN's Fr. Benedict Groeschel has cited the traditional Irish expression referring to a newborn as "nine-months-old by his mother's time," and HLI's March '07 Special Report noted that in "Taiwanese culture," "it is standard practice to count the nine months of pre-born life as part of a person's age." For the most part however, the "out of sight, out of mind" tendency has obscured the prenatal part of the life span--and it is just this quiet corner of human life that the +9 program is designed to illuminate. The sign’s simple design of the mathematical plus symbol and the numeral 9 transcends the language barrier, and turns the modern tendency to focus on self into a life-affirming self-reflection. Right-click here to download/save a simple +9 sign (standard size, prints in landscape)--fill in URL line with the web address of the local organization, church, etc. running the campaign--with the home page updated to include info or a link on the +9 program. Start a “Celebrate FirstDays like BirthDays!” campaign, promoting the slogan in both public and private areas and communications. [Also see our Web Banners page for printable FirstDay cards, stickers, color signs and e-graphics to use on the web, and follow us on Twitter and Facebook for easy sharing of graphics -- see homepage for direct links to "follow" and "like" us.] For years pro-life families have celebrated “FirstDays” with cards, gifts, and parties as a way to incorporate the pro-life philosophy into daily life. In 2000, a pro-life group in the USA (Youth for Life) even prepared a "firstday" card for Pope John Paul II (click and scroll down to read) to present to him in Rome on August 18th of that year (nine months before his birthday). As Zenit News Agency reported (5/16/00), the youth group's gesture was designed to "make the point that a person's life should be celebrated from its very beginning, nine months before birth." But the concept of celebrating one’s FirstDay can be brought to the wider society and has appeal for all ages--most everyone is receptive to the idea of enjoying a special occasion, especially for a good reason. “Firstdays” (a term cleverly close to “birthdays”) are generally celebrated a symbolic 9 months before a birthday, unless more accurate info is available (ex. : prematurity or original due date) to determine more precisely what is also termed "Life-Day". A “firstday” needn’t be costly or materialistic or involve a large gathering. For kids, a meaningful little gift with card and a balloon or small cake will suffice for an at-home celebration, or spend a day or evening out at their favorite amusement park or recreation area. If from an early age children are given a sense of their own worth from conception in a positive and fun way, they are also likely to see the worth of others from the very first, including the children they will someday conceive. But “firstdays” are for adults too--perhaps in the form of an outing to a nice restaurant for one’s favorite meal. We can’t assume others will remember our FirstDays, so keep in mind that it’s something you can do for yourself, even on your own if need be--like having a rarely indulged-in dessert or buying your favorite flowers. Marking firstdays with such innocent pleasures is an appealing way to change people’s thinking about their own prenatal lives to impact the way they see others in this vulnerable stage of life. Promoting this new FirstDay tradition is a gentle pro-life initiative suited to an all-ages general population, and also a way to deliver the message through the back door of those who are otherwise closed to anti-abortion messages. It harnesses the “treat yourself” trend and turns to good use the modern tendency to focus on self. If we are to celebrate, let it be something important, and if we are to appreciate ourselves, let us center on the unappreciated first nine months of our lives. Firstday celebrations have the potential to turn the wrong kind of self-love (that leads us to harm others) into the right kind (the kind that empathetically opens us to the worth and needs of others particularly the unborn). The traditional celebration of Jesus’ conception is an ideal time to spearhead a campaign to celebrate the conception of all children--indeed the feast of the Annunciation/Incarnation is the perfect way for Christians to introduce young children to this practice, for the conception of Jesus by the Holy Spirit can be freely discussed with those who have not yet had the “facts of life” talk explaining natural conception. Already we find the same organizations advocating both FirstDay celebrations and observance of the feast of Christ’s conception--we need only connect the two in order to maximize the impact. Priests For Life, which encourages pro-life Annunciation celebrations, announced their “FirstDay Project” in 1996--click here to read the article from their Sep/Oct newsletter of that year. It recommended the observance of “Firstdays” or “Lifedays” with greeting cards and celebrations. As stated in the PFL newsletter: “It's only logical! It may even make some people think! And it can be fun--let the celebration begin!” PFL reinforced the idea two years later in an 8/3/98 column entitled--How Are You Both? This article addressed the problem of unwittingly reinforcing the culture-of-death by failing to recognize the unborn in everyday speech, expressions, and traditions; beginning new traditions like FirstDays was suggested as part of the solution. Of course the historical observance of Christ’s conception (and for Catholics, Mary’s as well) proves the concept is not entirely new, and in more recent years pro-life blogs have promoted the natural connection between the celebration of the Annunciation and FirstDays. Some E-card sites offer simple cards for Conception Days -- this one from SomeEcards.com -- but often without context or mention of the pregnancy-length interval before a birthday. DayOfTheUnbornChild.com's free e-cards/banners (to receive & then forward to others via your own email) all give context and varied degrees of explanation depending on the mood and age group targeted. In addition, National Right to Life Committee, the oldest and largest pro-life organization in the U.S., promoted the idea of Conception Day celebrations on its NRLC.org website via a great article entitled: "Marking Your Making: ConceptionDay Cards Celebrate the Gift of Life in a Fun Way, with Educational Significance" -- written by Holly Smith, Advisor and NRLC Field Coordinator -- Click Here for the text of the National Right to Life Committee article on Conception Day Cards. The article begins with an anthropological anecdote noting that some cultures have long celebrated a person's life nine months before birthdays instead of the date they were born, and continues describing the work of Dr. Keith Scheinblum to resurrect the practice via creative "ConceptionDay" cards, which made their way into pro-life conventions and some Hallmark stores, and also received coverage on ABC WorldNews and in magazines like Greetings, Etc.--the primary periodical for the stationery industry. Sold via the website HappyConceptionDay.com, humorous cards offer a second chance for those who send cards for belated birthdays, because Conception Days are celebrated three months after (the same as nine months before)--the text of one could raise a smile even as a secular greeting card: "This card may be late for your birthday, but at least it's early for your ConceptionDay!" The CatholicExchange,cin site also includes an interesting article "Happy Conception Day" by Stan Williams encouraging celebration of Conception Days in which he notes their pro-life import and also their relationship to celebrating Christ's conception on the Feast of the Annunciation -- here for a link to the article. Note: If you are searching for information on firstdays using search engines, try both plural and singular, and keep in mind that the form of the term (one or two part word, hyphenation, capitalization) can vary depending on whether it aims to emphasize the freshness of the idea (FirstDays, First Days, First-Days) or the continuity of celebrating them in addition to the similar sounding “birthdays” (firstdays) -- (also search for Conception Day, Conception Days, lifedays, LifeDays, Life-Days). Prepare signs and t-shirts for the occasion (you can design them yourself at Vistaprint) -- for example, “March 25~Day of the Unborn Child~(9 Months Before Christmas)” or "Mar.25~Feast of Christ's Conception~(9 Mos. Before Christmas)", and notify the media of large scale events. Pro-life signs for the occasion should focus on the importance of conception: "You Matter--From Conception" -- "Human Life Begins At Conception" -- "Respect Life From Conception" for example. See our web banner page for ideas and sign versions of our banner images. Look forward to spring with a fun "Fairy Baby" crafts project to familiarize kids with the stages of prenatal development through pre-born models while making fun memories reinforcing the positive message of the pro-life movement. Entrants can be asked to give their Fairy Baby a name and include it on the entry form. When organized as a contest sponsored by schools or pregnancy centers, a fairy baby contest can engage the culture with a festive seasonal event. Whether used as a start or end date, the March 25th "Day of the Unborn Child" (nine months before Christmas) should be highlighted in all publicity (newsletters, fliers, website, posters, Facebook/Twitter). Using March 25th as the date to begin accepting entries is an easy way to tie the Day of the Unborn to the contest each year. Mother's Day can be used as the closing date (requiring that all fairy babies be "delivered" by the second Sunday in May -- this way the competition is tied to two life affirming days each year. (If stressing the date as traditional Annunciation Feast of the Incarnation, the contest can also stipulate faux carnation petals be incorporated into each entry to associate March 25 with this lovely symbol of "Incarnation"). A pregnancy center might distribute models of one particular age (12 wks. for example), or ask participants to choose an age from a selection of sizes, which gives an implicit lesson on gestational growth. Winners may be awarded gift cards from craft stores like Hobby Lobby or other businesses supportive of pro-life causes or local CPCs. Photos of winning entries can be published in the organization's newsletter/website. Additionally all entries might be displayed for a few days leading up to March 25th at the local Crisis Pregnancy Center to encourage people to come in a community outreach setting, learn where it's located, and feel comfortable about going there to volunteer or referring others. For a photo of a fairy baby example see the photo section of https://www.facebook.com/AnnunciationDayMarch25 for the "Pre-Born Model Flower-Fairy Baby" album. (Be sure to research current rules/tips for running a contest in your state and examples of standard entry forms/releases/permission-slips). To see a photo of an example visit the Facebook page photo section for the "Pre-Born Model Flower-Fairy Baby" album. Plan a special March 25th March for Life -- in the event's name, signs, and promotion you can make use of the play on words with the month of March -- "The 25th of March for Life: Join us for a pro-life march on March 25th, the day honoring Christ's conception that is celebrated nine months before Christmas." Note: In warmer climates late March often coincides with the start of outdoor festivals -- consider holding your march in proximity to these for maximum impact. For example, pro-life groups in the Washington D.C. region might want to hold their march in areas heavily visited for the cherry tree bloom and Cherry Blossom Festival held from late March to early April. (Remember to inquire about what permits may be needed well in advance). Please also see the sections on selecting this day to launch a “+9” or “Celebrate FirstDays like Birthdays!” campaign as well as the General suggestions linked at the top of the page, many of which are suitable for pro-life groups and organizations--for example, having a carnation sale on the day to remind us it is the feast of the Incarnation, and to raise funds for a pregnancy center reminding us it is also the Day of the Unborn Child. Use live webcams from Nazareth, pilgrimage videos and virtual Internet "armchair" pilgrimage video sites, or virtual pictorial tours to visit locations or shrines associated with the Annunciation -- particularly the church of the Annunciation basilica in Nazareth where an inscription states "the Word was made flesh here." Virtual pilgrimages can be made via the live feed from the site of the Annunciation in Nazareth at the grotto -- it creates a lovely visual background for prayer and/or contemplation on Christ's conception -- to be able to see in real time the place where the Word became flesh, and pilgrims coming to visit this hallowed Holy Land site at the Church of the Annunciation. (For group prayer use a device with a large screen). The live feed is viewable 15 hours a day at Annunciation Grotto -- in EST the times are 11 pm through 2 pm the next day (please note the live feed is often on 24 hours a day but light levels may be too low to see anything but candlelight). Also relevant is the Holy House of Loreto in Loreto Italy where it is believed the actual house where the Annunciation/Incarnation took place was transported. Click here for the Loreto pilgrimage video hosted by Bob and Penny Lord seen on EWTN, and EWTN's Religious Catalogue (1-800-854-6316) offers two DVD's--"Loreto: The Mystery of the Holy House" (click here for info on this item # 20445) and also "Forgotten Heritage: Europe and Our Lady" (click here for item # HDFH2) which is a combined set that features Loreto among other important locations including the Annunciation-themed pilgrimage site of Walsingham. England's Walsingham is of interest as the historic destination of pilgrims where an ancient replica of the Nazareth house was built (in addition to the combo Loreto/Walsingham DVD linked above, there is a beautiful video on the story of Walsingham as dedicated to the Annunciation in Part 3 of the 4 part series The White Dove of Peace--click here for availability--which aired on EWTN in 2008). Also available from EWTN on DVD is a beautiful historical and visual tour of "Walsingham: England's Nazareth" hosted by Joanna Bogle (alternately titled "Walsingham: England's National Shrine Of Our Lady" or simply "The Story of Walsingham")--click here for info. For more information on these world-famous shrines/churches, see the International section of the Events page--click the following links to go directly to the sections on Nazareth, Loreto, and Walsingham. (Annunciation pilgrimage videos can also be shown to groups for the occasion, as for a family/church gathering or an Annunciation feast day tea or dinner). If there are no official events for the day in your area, look up churches or shrines near you that are named for the Annunciation or Incarnation and call for the times of services and the hours they are open for visitation. (Use Internet yellow pages and type in your location and enter the search word Annunciation or Incarnation). Some churches and many shrines have outdoor areas for prayer so that you can visit at any time. Go yourself or bring family and friends -- consider making it a family pilgrimage for the occasion each year. You might bring a fresh carnation to leave outside the church to symbolize the Incarnation.